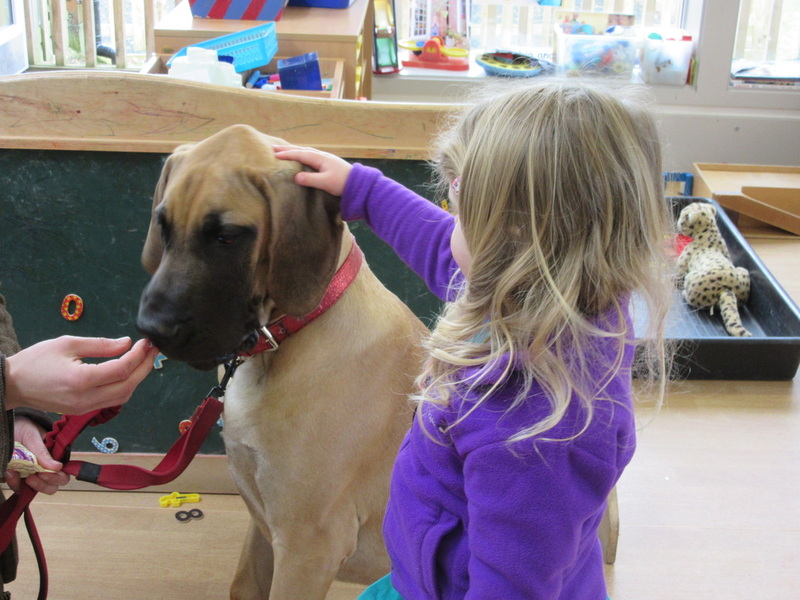 A big dog and a small dog came to visit Pre-School! 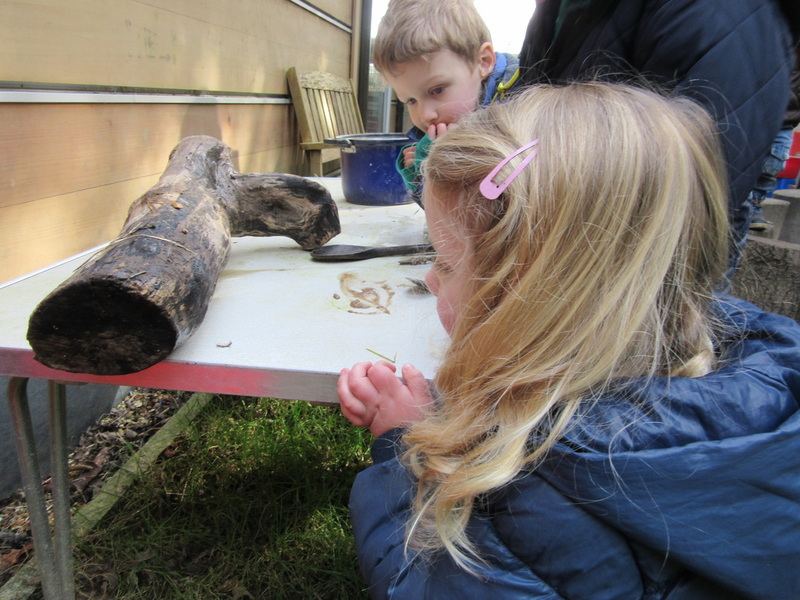 We used magnifying glasses to help us see and identify some of the mini beasts living underneath our log pile! 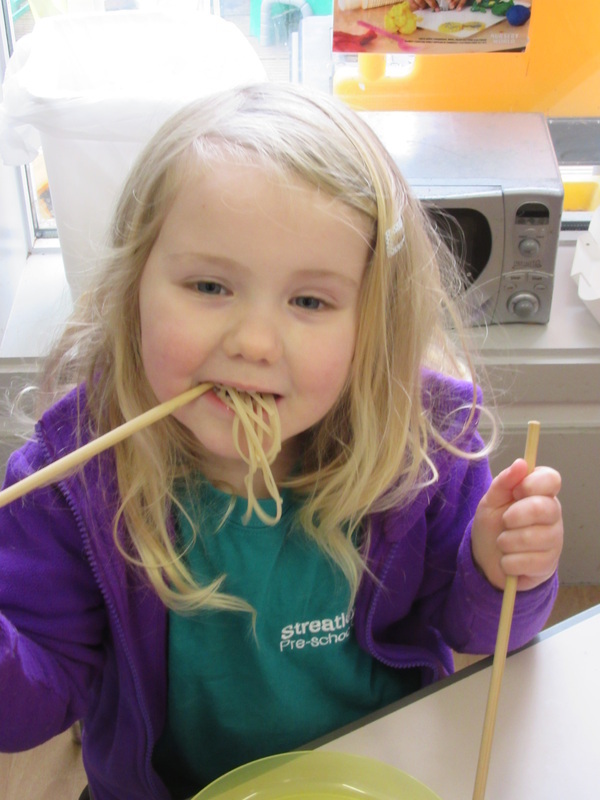 In February we learned a bit about Chinese New Year and tried using chopsticks to eat noodles. Tricky things! 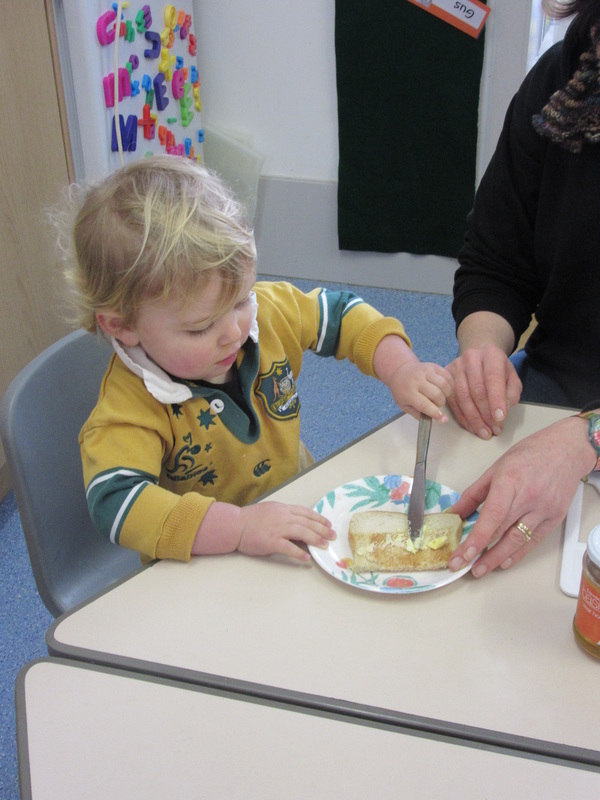 In January we made toast and kept a tally of what everyone liked to spread on it! 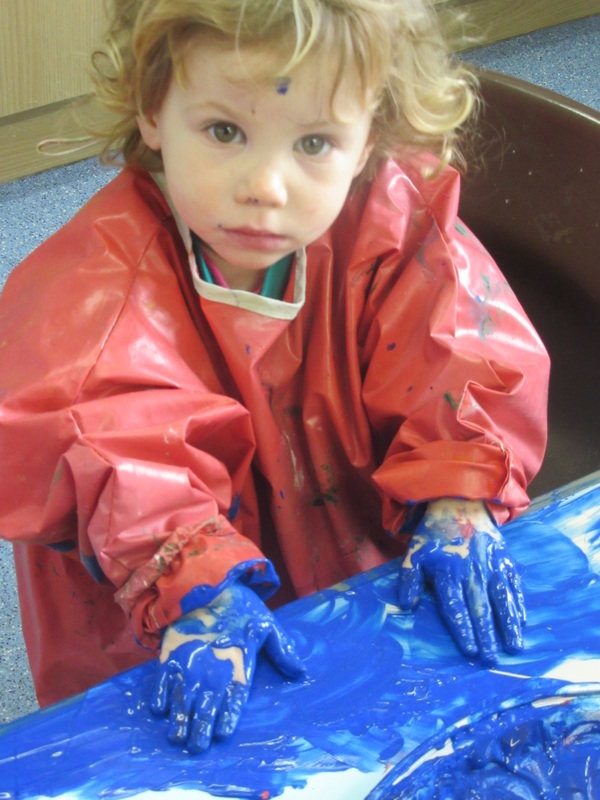 We love the texture of paint! Jo did some science – she made the coke explode! 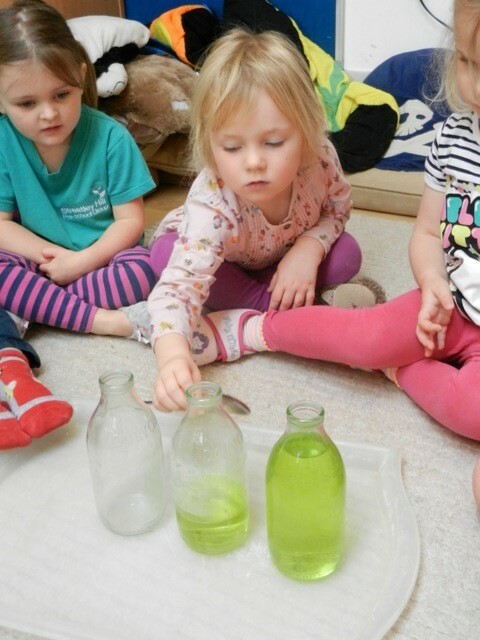 “On a dark, cold, winters day we turned out the lights and shared the story of the bears in their cave, (“Can’t You Sleep Little Bear”), using lighted candles to illustrate the lanterns!”. 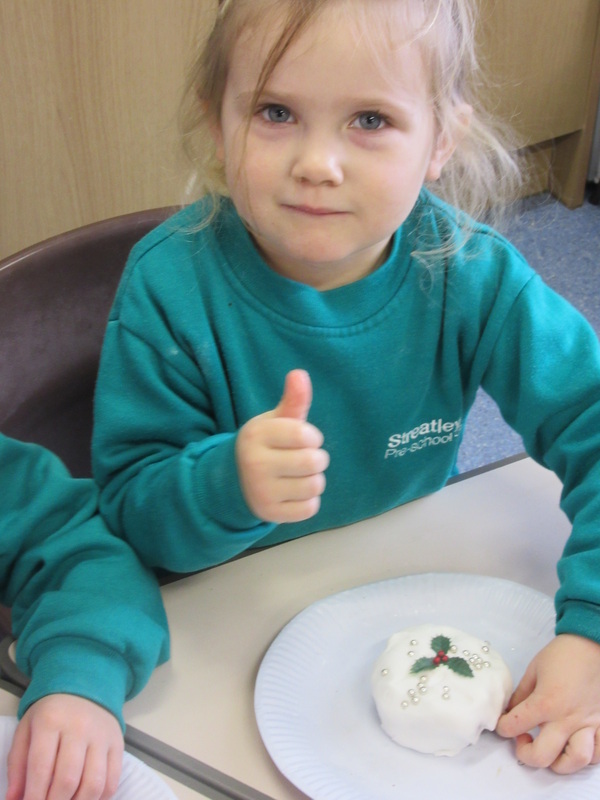 We celebrated Christmas at Pre-School in lots of ways. 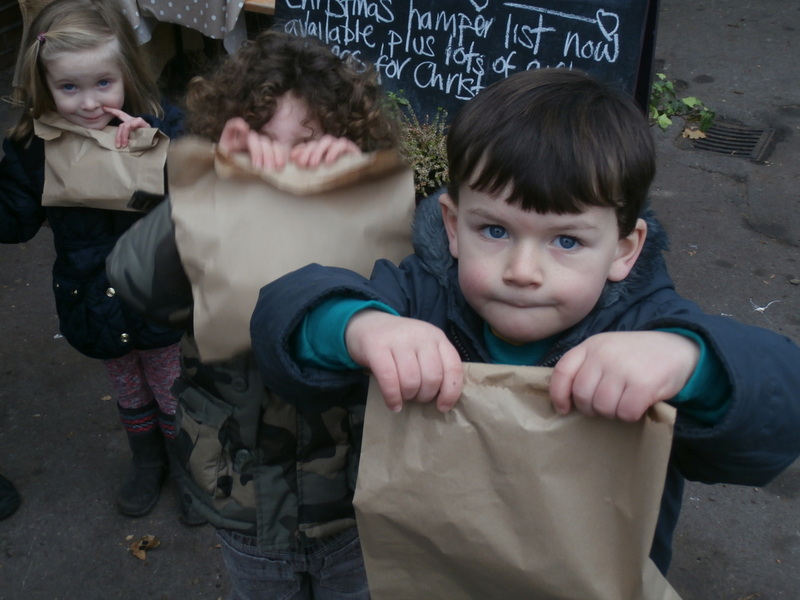 The children made decorations, Christmas Cakes and Christmas cards which we walked to the post box to post to their Mummies and Daddies. We joined the Foundation Class at Streatley School to drink hot chocolate and sing Christmas Carols around the Christmas Tree. Rev. 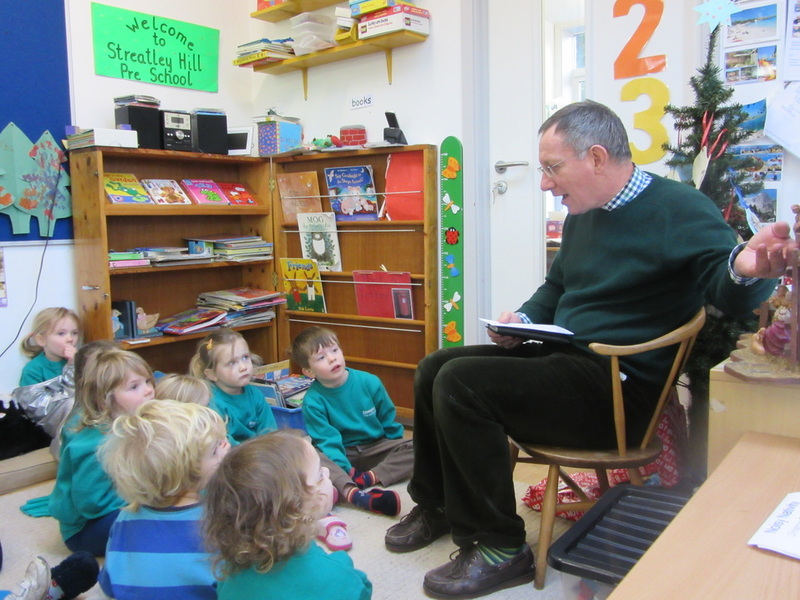 Paul visited to tell us about the nativity and local author Bev Wilden told us other Christmas stories. We finished with a Christmas Party in the Morrell Rooms. 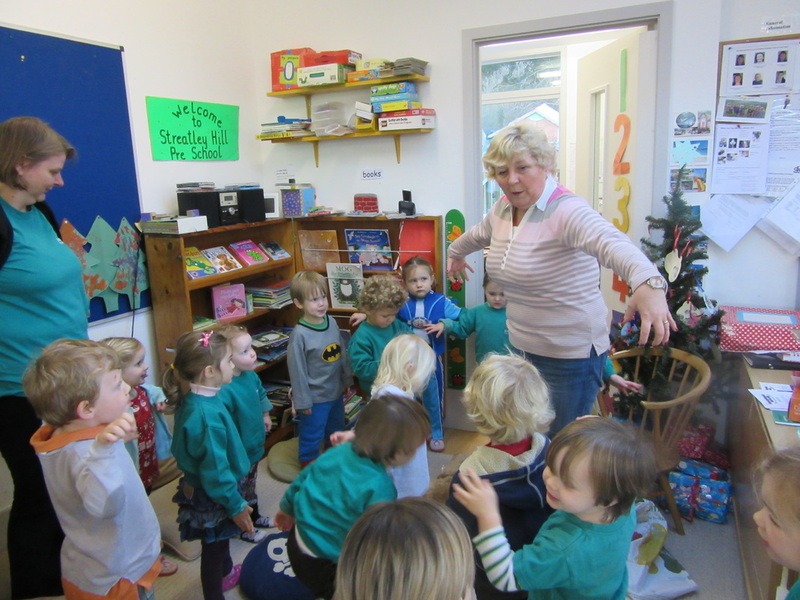 During November we had some special visitors at Pre-School ! Toby's Grandma came to visit us - all the way from Canada! She brought with her some Maple Syrup. 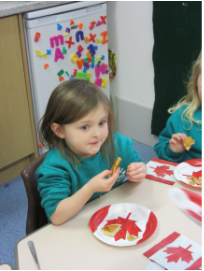 She told us where the Maple Syrup comes from and then we ate pancakes with Maple Syrup on them for our snack. 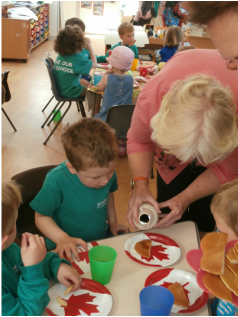 Toby's Grandma also brought some special Canadian plates and napkins for us to use which had the Canadian flag on them - the Maple Leaf. Afterwards she read us some new stories from Canada. Eva's Grandma came to visit and brought along her dog Pippa. 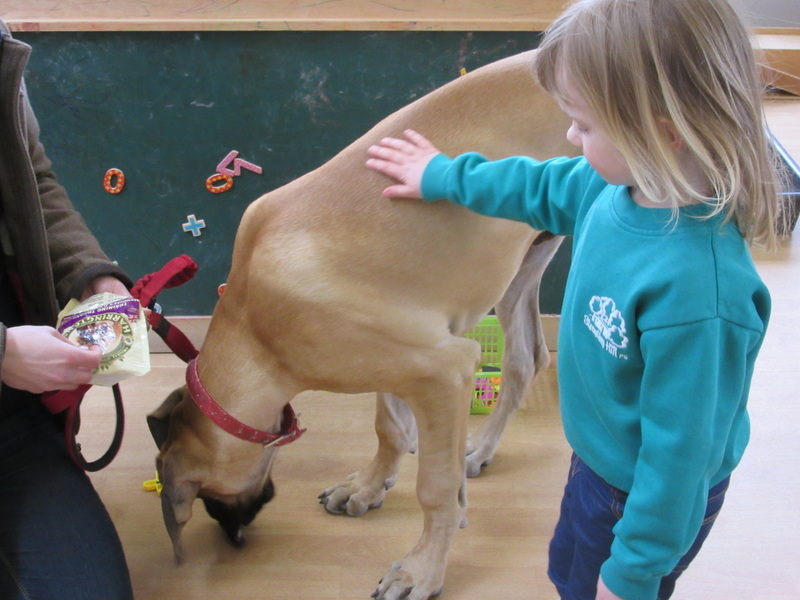 She talked to the children about the things she has to do to look after her dog. 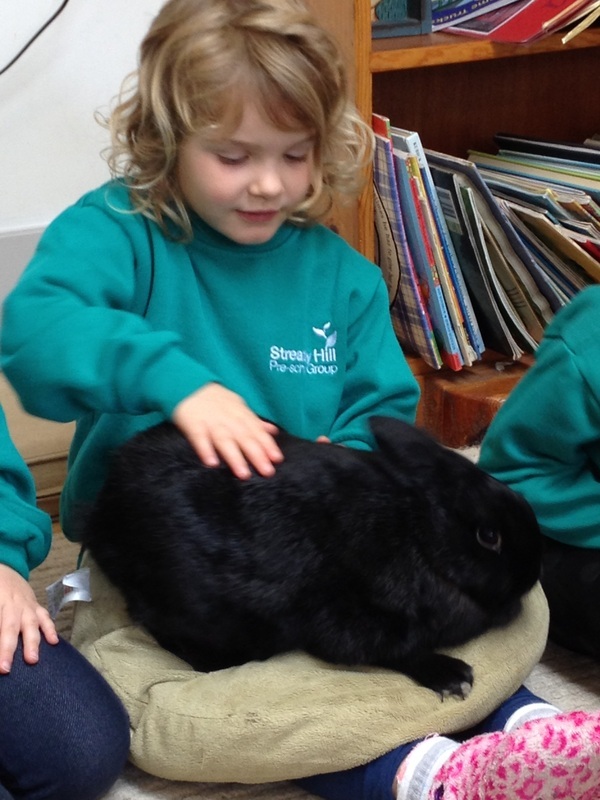 The children all had a turn at stroking Pippa - she was soft and warm! They had a chance to brush her silky coat and feed her a dog treat. 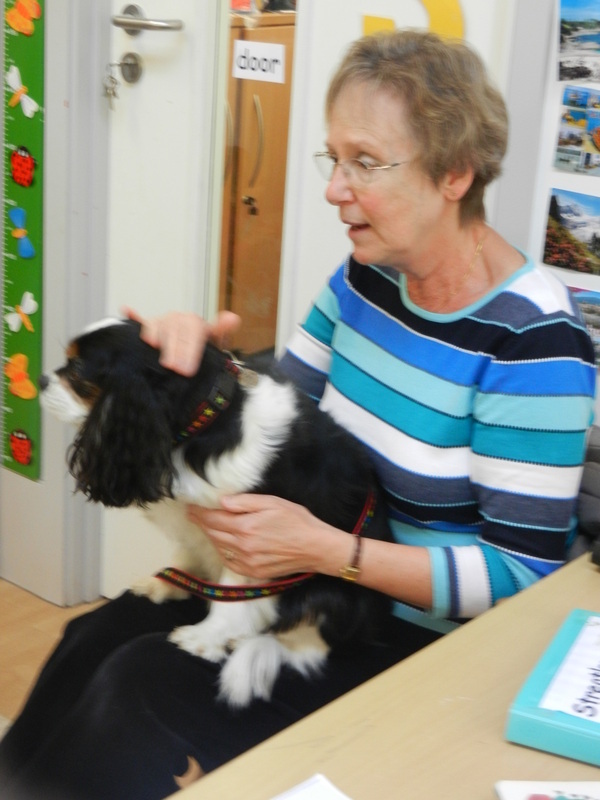 Afterwards Pippa sat on her owners lap while she read us a story about Kipper the dog. 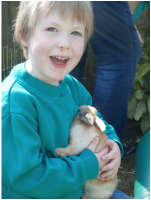 And on two days our own Sam brought along Rabbity the Rabbit and everyone had a chance to hold him and stroke him - he was soft and warm too. 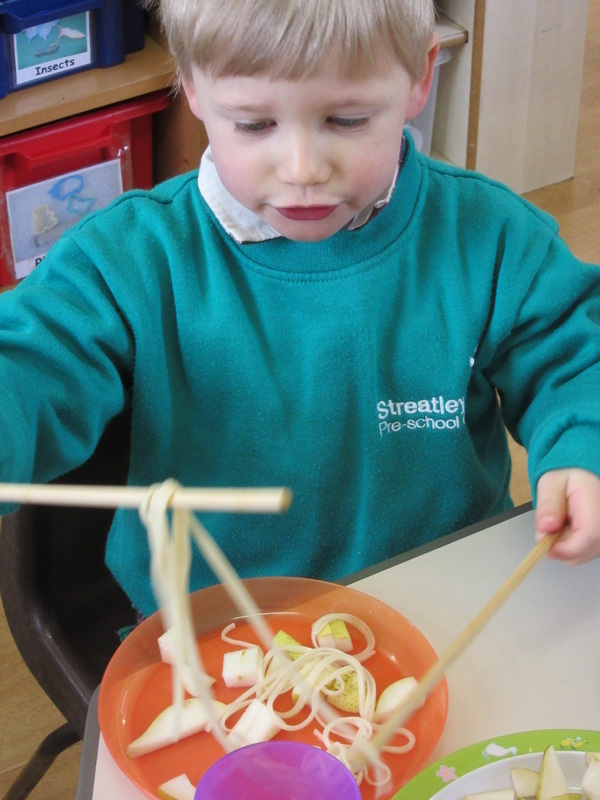 Sam told us about and showed us the food he eats and the straw he uses for his bed. We looked at his twitching whiskers, his long ears and his big back feet. Afterwards some children chose to make rabbit pictures and we had a story about a little lost rabbit. 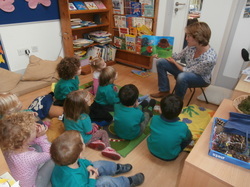 A big "Thank You" to all our visitors and story readers! 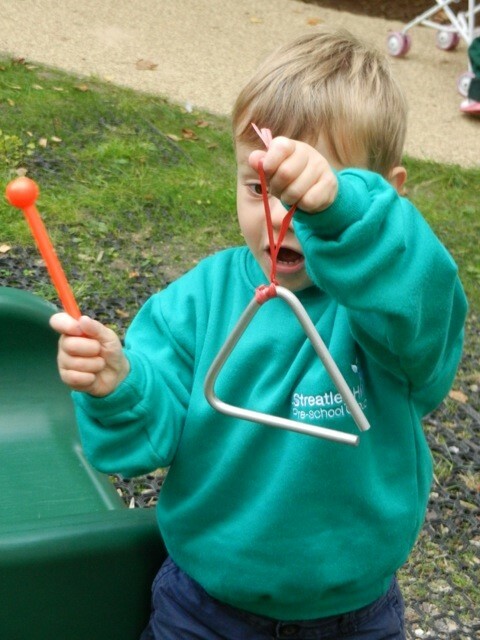 We have been to visit our friends in the Foundation Class at Streatley School and listened to their singing and the instruments they had made. 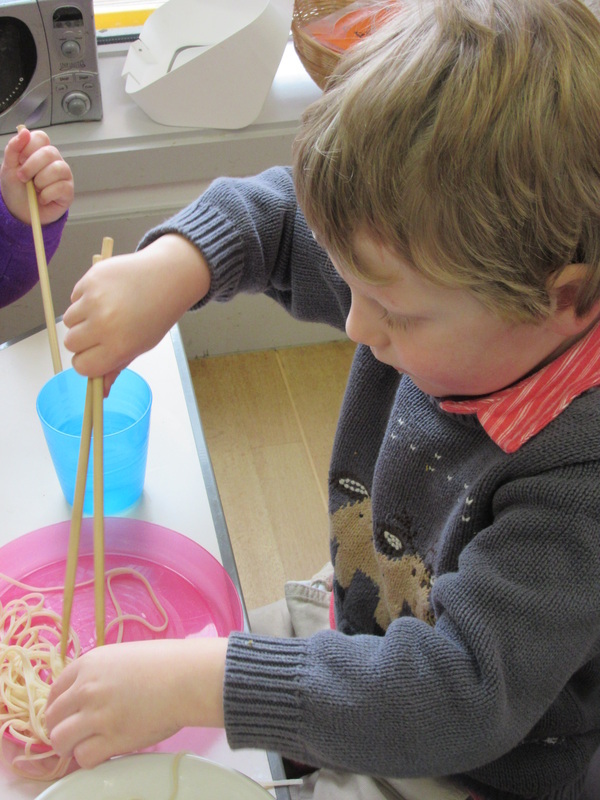 We have explored all kinds of things that make a sound and some of us made instruments too. 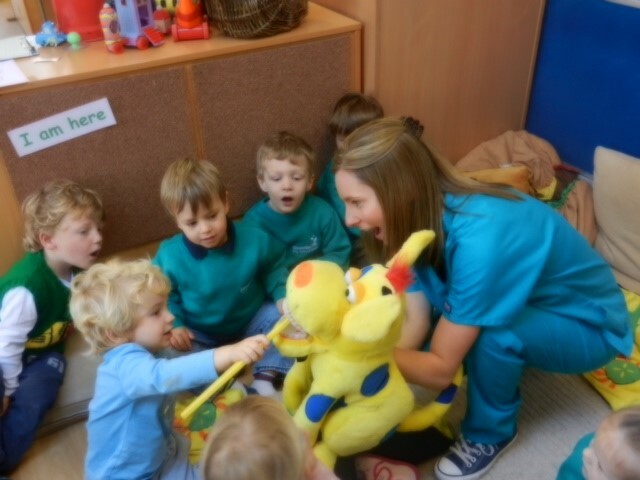 On Thursday 16th October the children at Streatley Hill Pre-School had a visit from Harry, a dentist at the local Boathouse Dental Surgery. 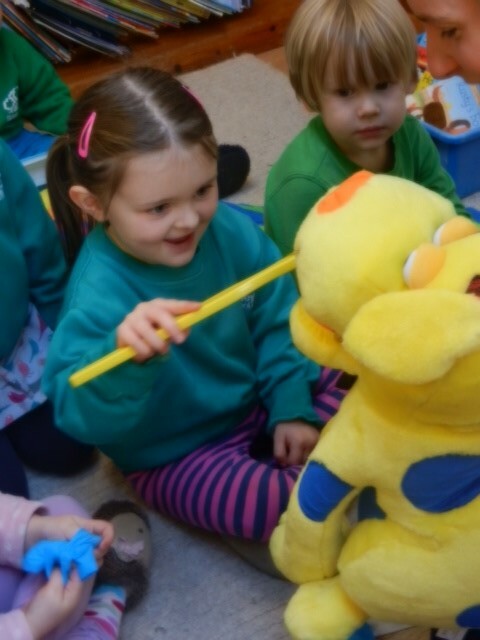 Harry brought along her friend Gnasher - a large, yellow dog puppet with beautiful teeth! Harry talked to the children at just the right level explaining about the special gloves and masks she wears when she looks at teeth and showing them that she is still smiling even with her mask on! She passed around masks and gloves for them to try ! She told the children about the importance of brushing their teeth twice a day for 2 minutes and used her giant timer to show how long that is. Then Harry gave Gnasher's teeth a good clean with his own special giant toothbrush. 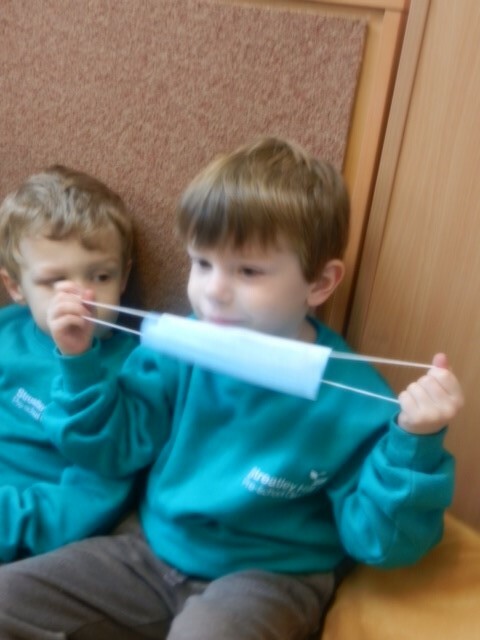 She showed the children how he needed to open wide so she could reach right to the back teeth and put his teeth firmly together so she could brush the front teeth up and down. Each child took a turn at giving Gnasher's teeth an extra scrub! At the end of the morning each child received a Goodie Bag with a toothbrush, mask and other goodies! 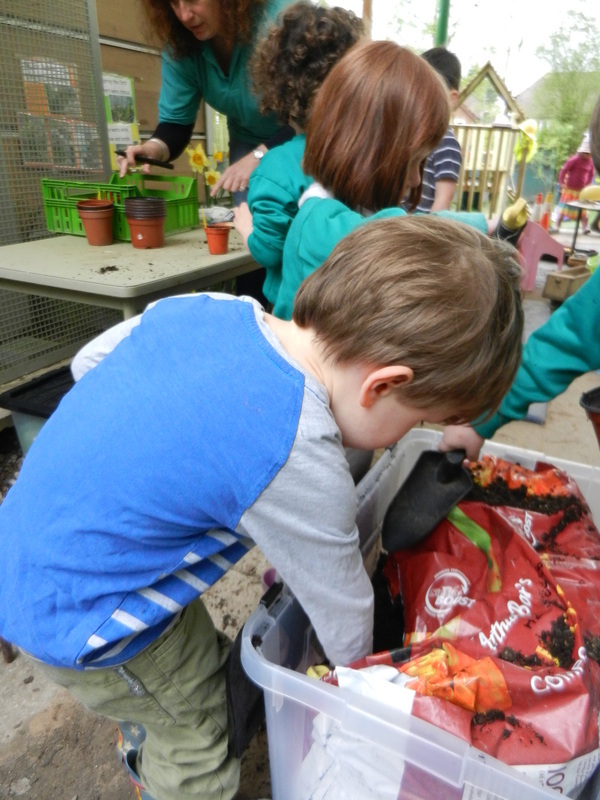 Also in October the children have all had a turn at planting some bulbs. 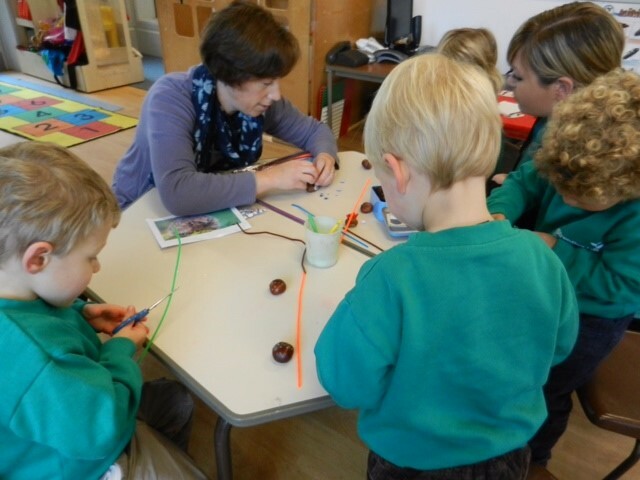 Tom’s Mummy came in and showed us how to make hedgehogs from all the conkers we had collected! We have picked lots of tomatoes from the tomato plants we grew! We eat them as part of our morning snack! 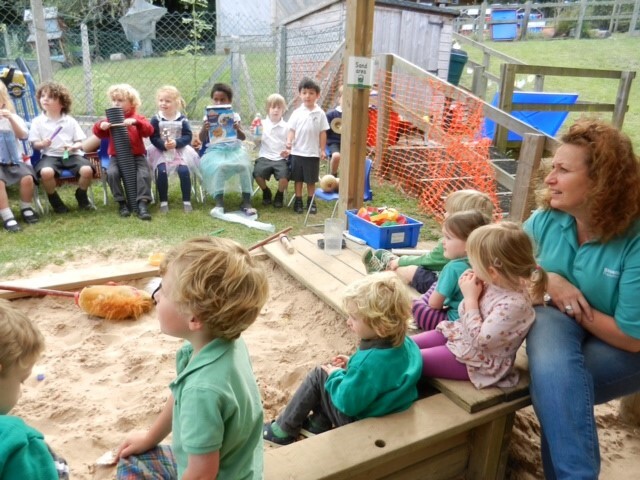 ﻿Our large new﻿﻿ sand﻿pit has proved to be a firm favourite with all the children! 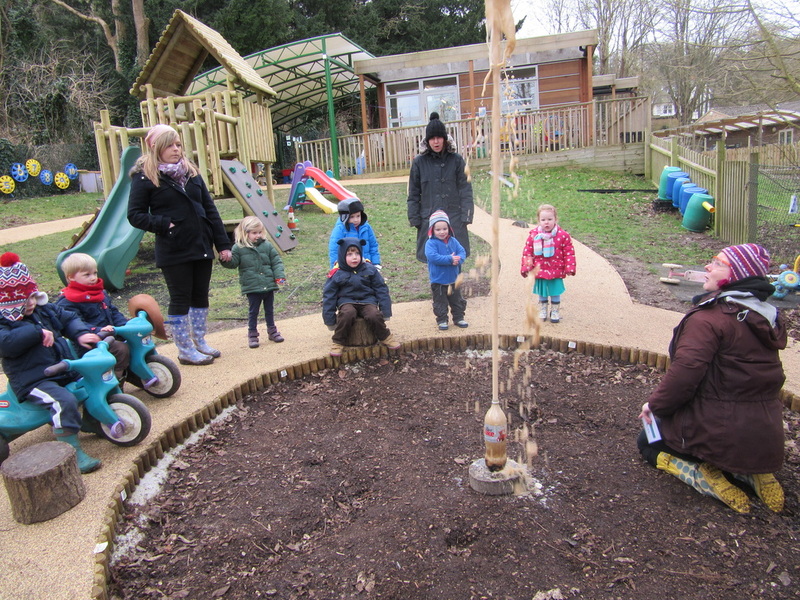 The children love the new bubble blowing machine! 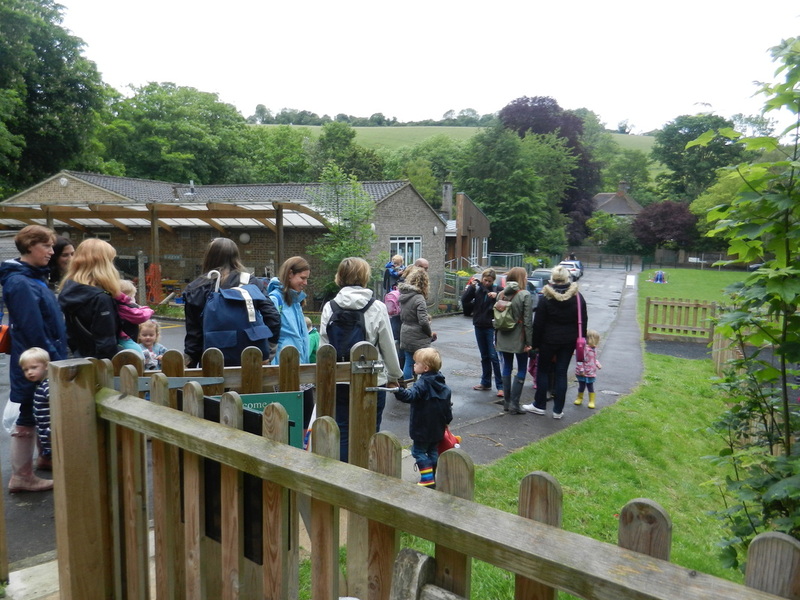 The children who moved over the road to Streatley School have already been back to visit us with their Teacher and Nursery Nurse. They like our new path and sandpit! 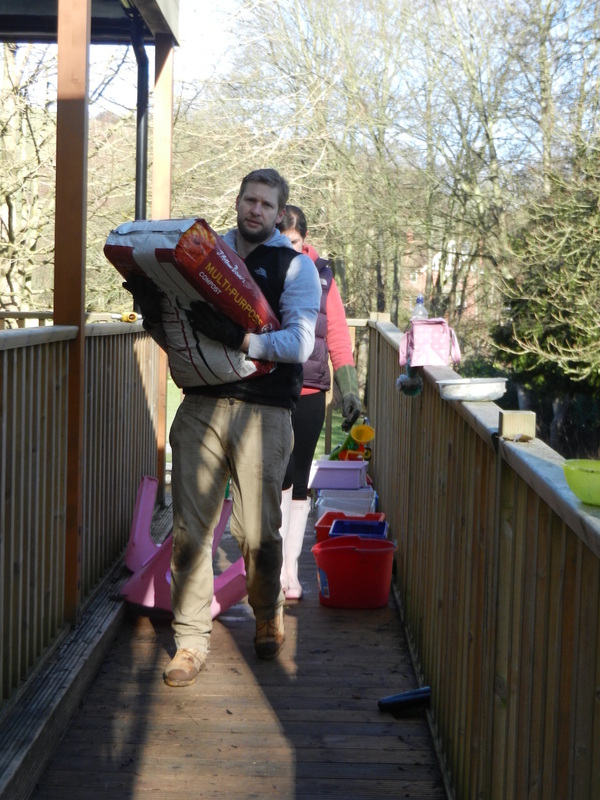 They have also settled into their new surroundings really well – our smoothest transition ever. Over the summer holiday we have had an amazing new path laid around our garden. 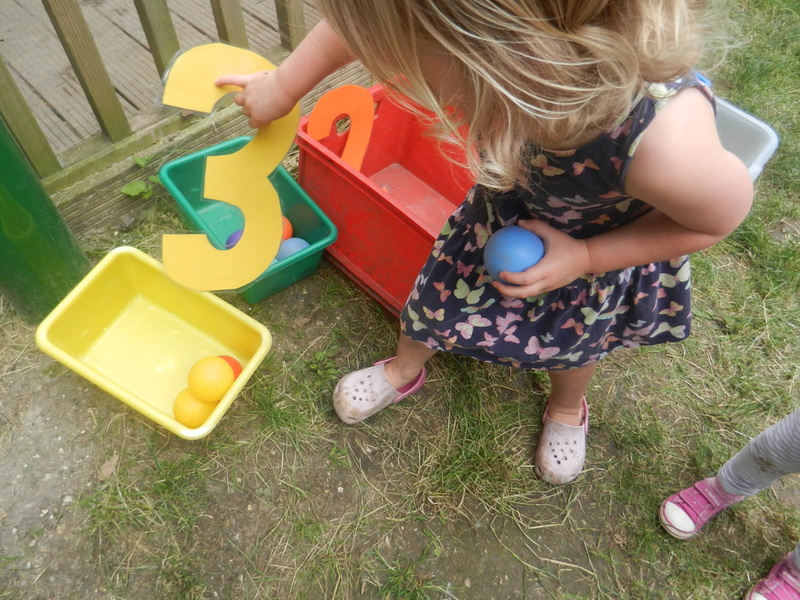 We also have a large new sandpit. The children think it is all great! We also said “Goodbye” to all the children who were leaving us to move on to school. They were presented with a book to remember us. 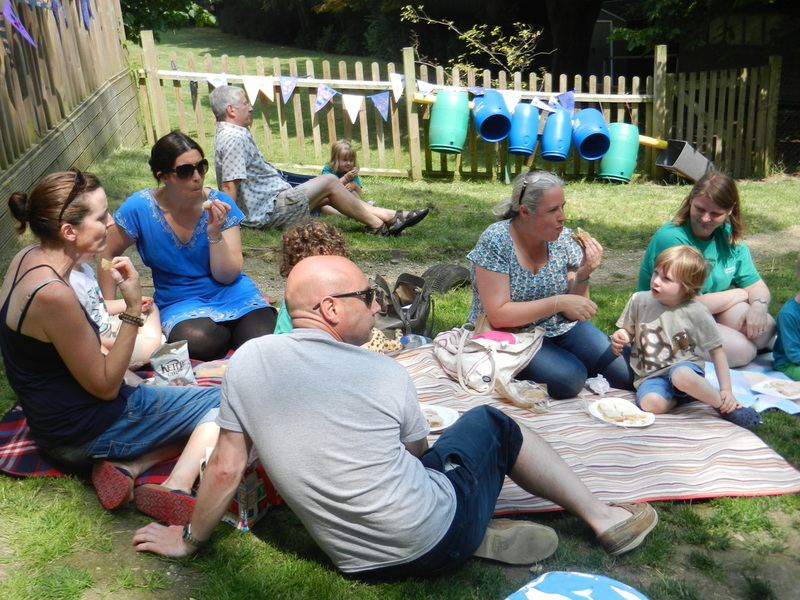 On the last day of the Summer Term we had a Garden Party for all our children and their families.The children made the picnic themselves including sandwiches, jelly and yummy cakes! 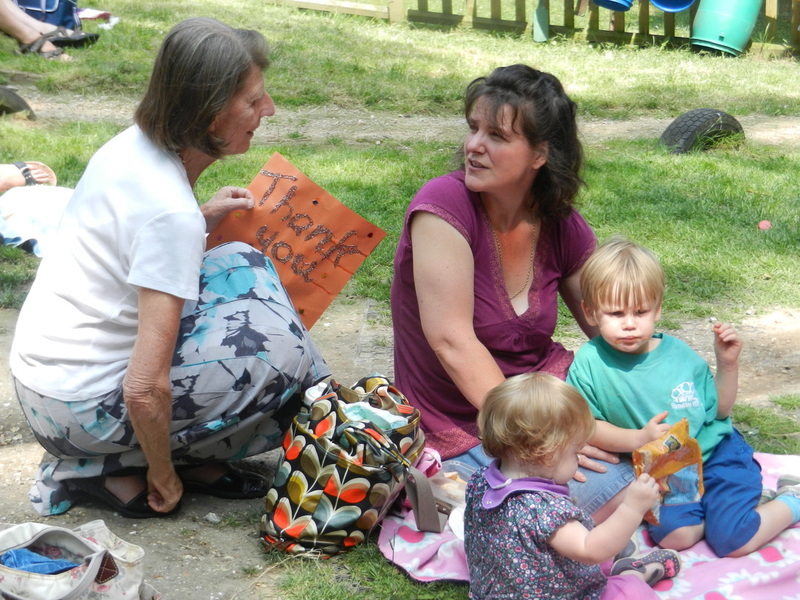 Parents, grandparents and child minders all came along to share it with us. 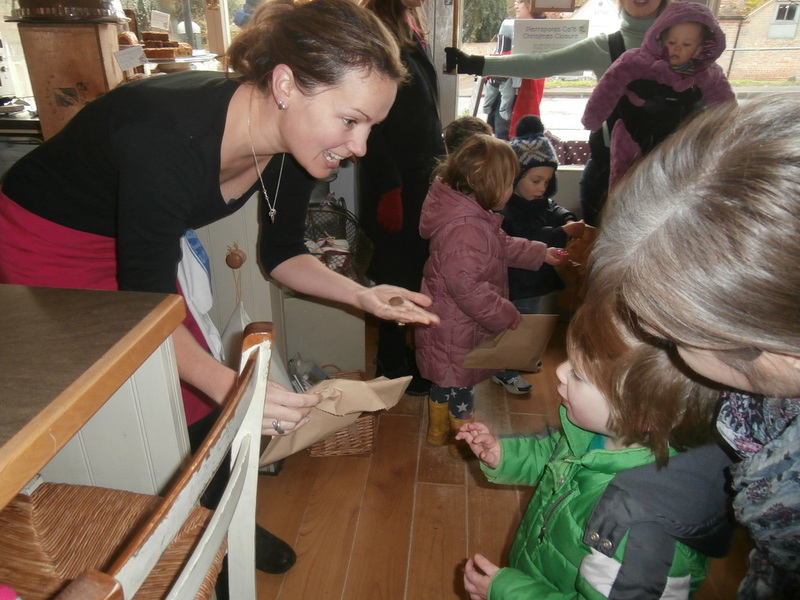 It provided the opportunity to have an official opening of our new canopy; Tina Farr, a local supporter of the Pre-School, who always hosts our Easter Egg Hunt, cut the ribbon. She and her husband John had donated a substantial amount towards the cost of the canopy. Afterwards Tina and John mingled with the families. 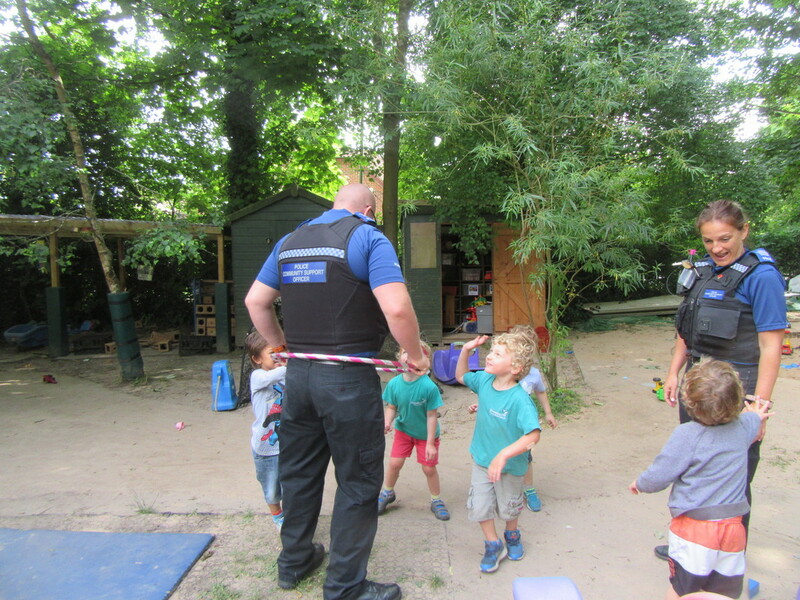 It was also great to welcome our Community Support Officer who came along with another member of her team; they soon got involved in helping to give out the jelly! 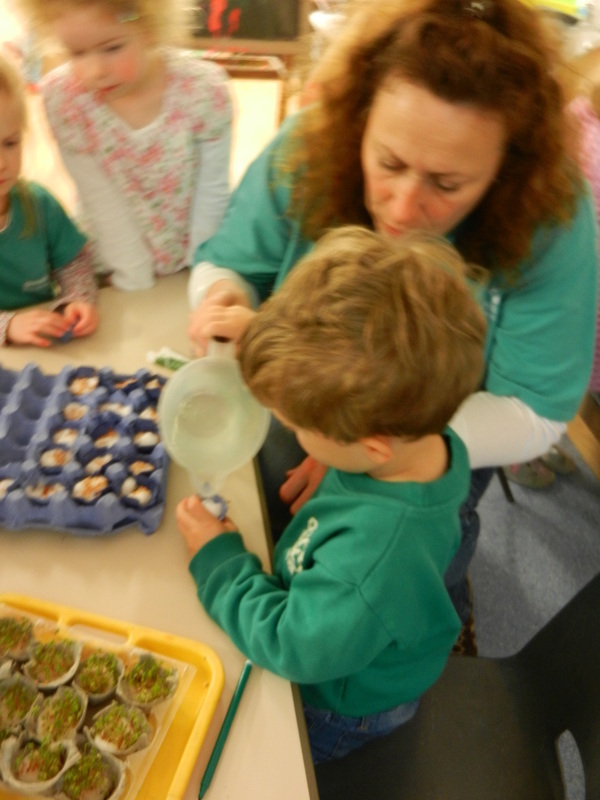 We visited Streatley School Foundation Class to see the eggs they had in an incubator. We went back three more times to see the newly hatched chicks and then see how they grew and started to get feathers. 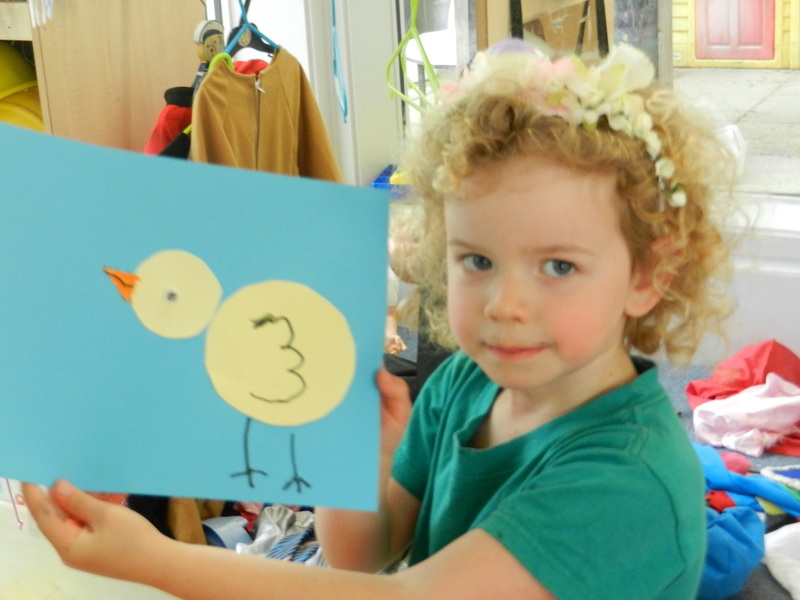 Some children chose to paint pictures of the chicks and some made pictures from shapes. 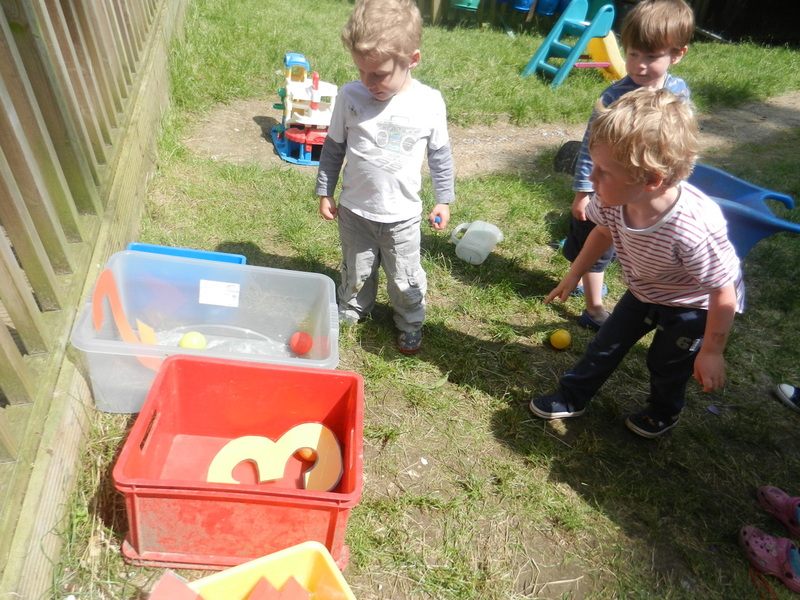 We really love our mud kitchen! Thank you Andrew for building it for us! We have learned that circles roll! Good teamwork everyone! Water is great for a spot of decorating! Our plants have grown. 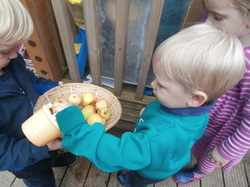 We are really proud of our strawberries and have eaten some for snack. 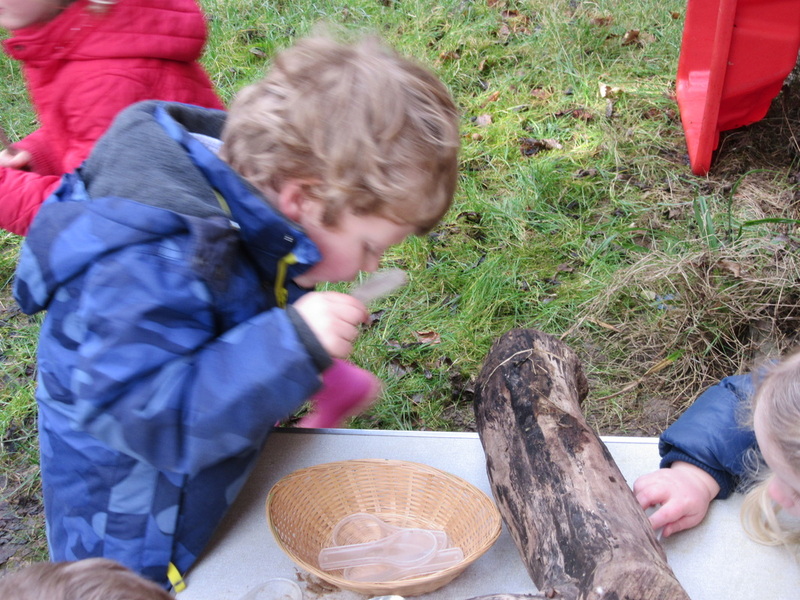 We have been out and about a lot using the School Outdoor Classroom and the woods. Good balancing everyone! Today our local author and story teller, Bev Wilden, came to visit. She read the children some pirate stories and sang some pirate songs. She gave them all a little paper pirate and helped them find the words to describe him. 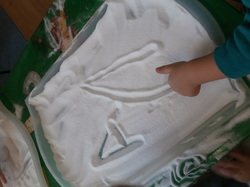 Afterwards some of the children chose to draw a pirate ship for their pirate to go on! After one child returned from a holiday with her Grandparents in Australia another pointed out we could “Do the World” at Pre-School! So we have been talking about places we have been and people we know from other countries. We found out about the North and South Poles and which animals live there. Toby’s Grandma from Canada came to tell us about Canada and read us a story. 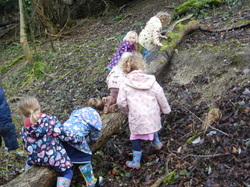 Some children have been very busy looking under the log pile for mini beasts! We have used our magnifying glasses to examine them more carefully. We have even had a go at drawing them and learned that the shape on a snail shell is called a spiral! 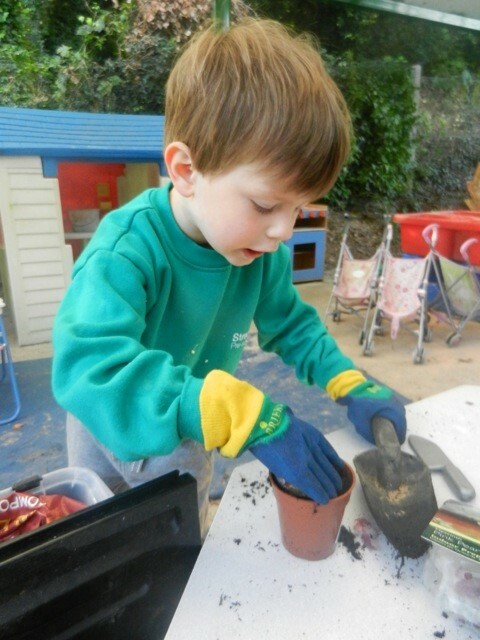 This term the children showed an interest in the daffodils in the garden and also in making flowers from construction toys so we decided to do some growing. 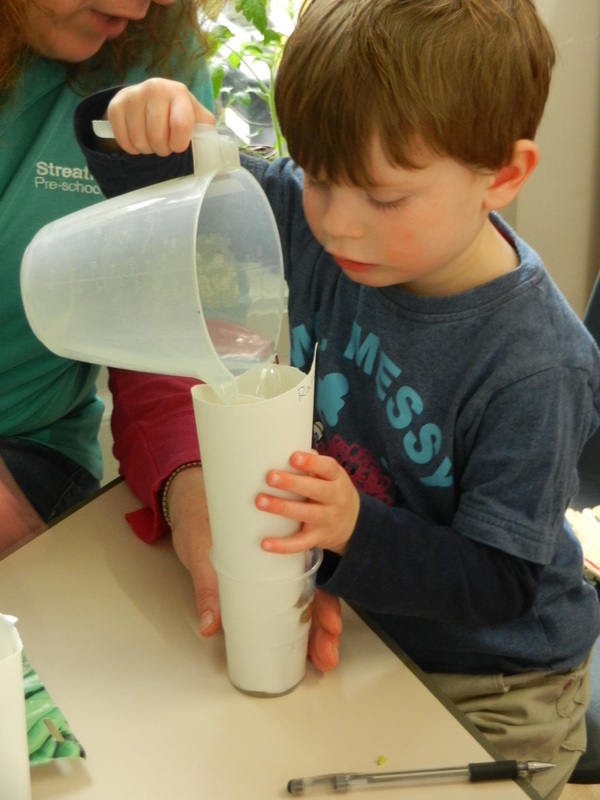 We started with cress grown on cotton wool – the children were able to take this home a week later! 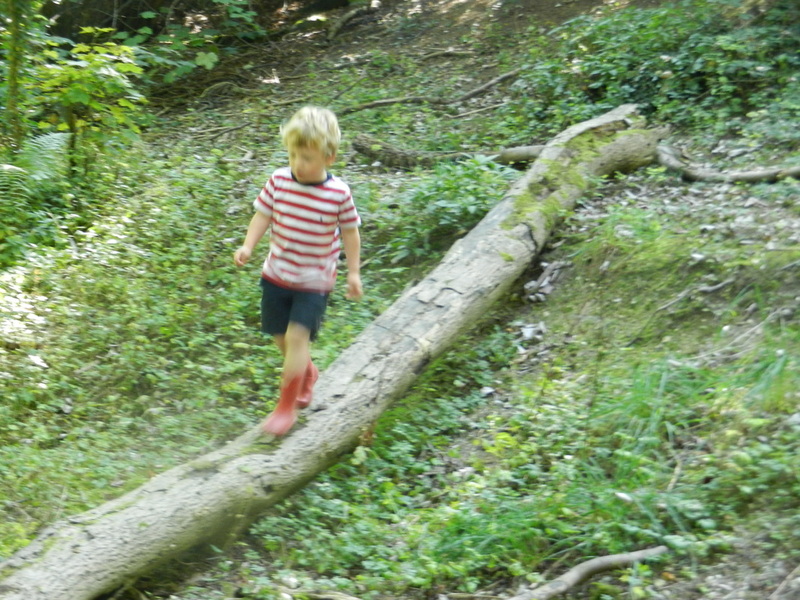 Then we moved on to more adventurous things! We have tomato and strawberry plants growing with flowers on the latter already. 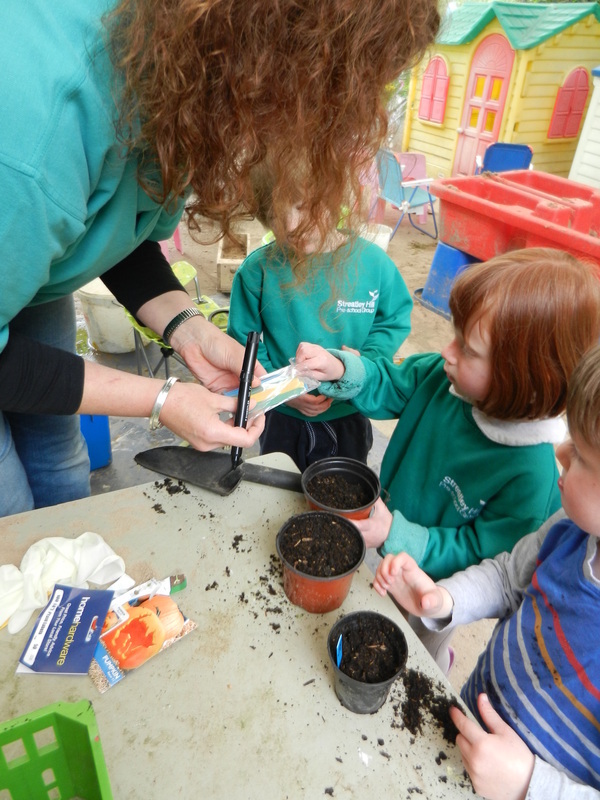 We have planted broad beans in plastic jars so we can see the roots and shoots. 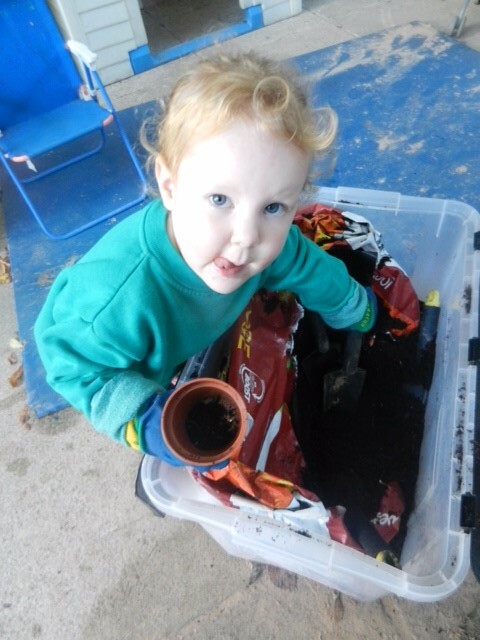 We have planted pumpkin, sweet pea and a host of other flowers! Our garden should look lovely by summer and we should have some things to taste as well! 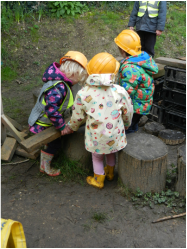 This week some children started to do some building in the log area. 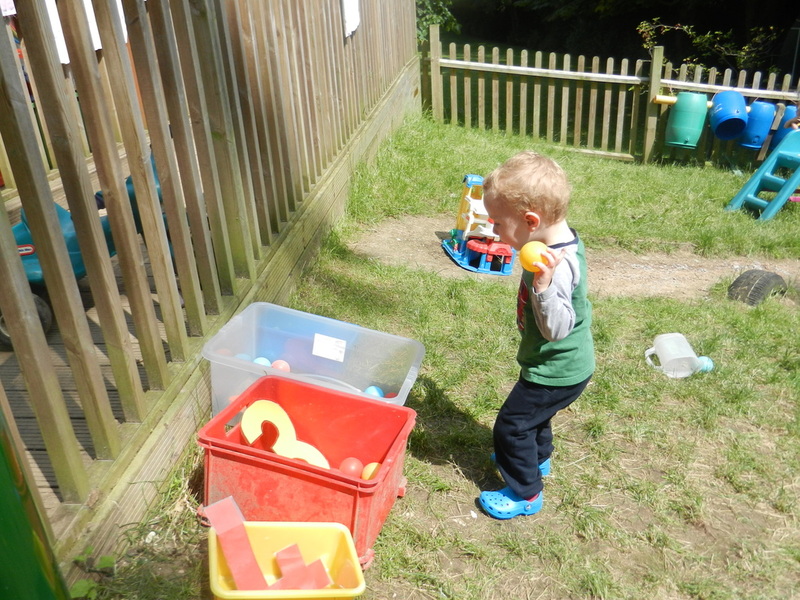 We introduced the builders hats and hi-visibility jackets, traffic cones, more wood and milk crates. 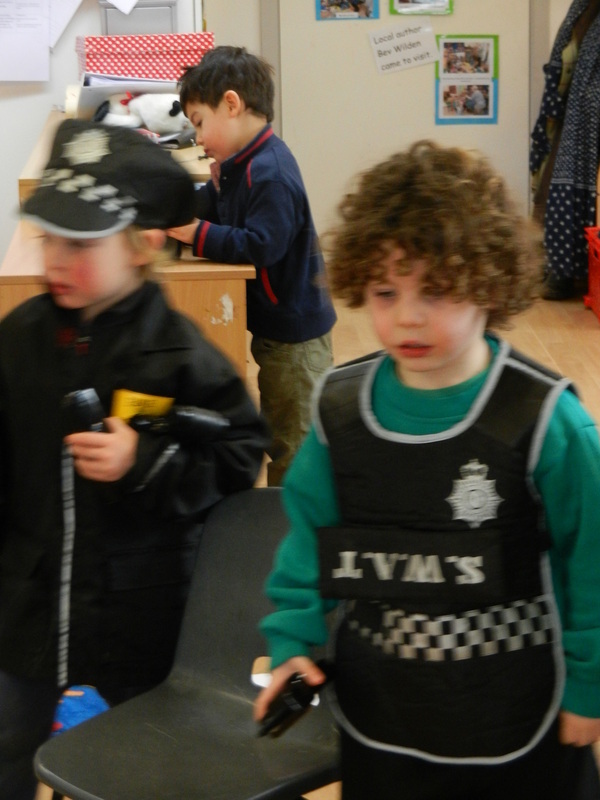 Many other children joined in and soon we had a large role play “building site”! One of them said,”We are building a maze.” They had to work together to lift the planks of wood. 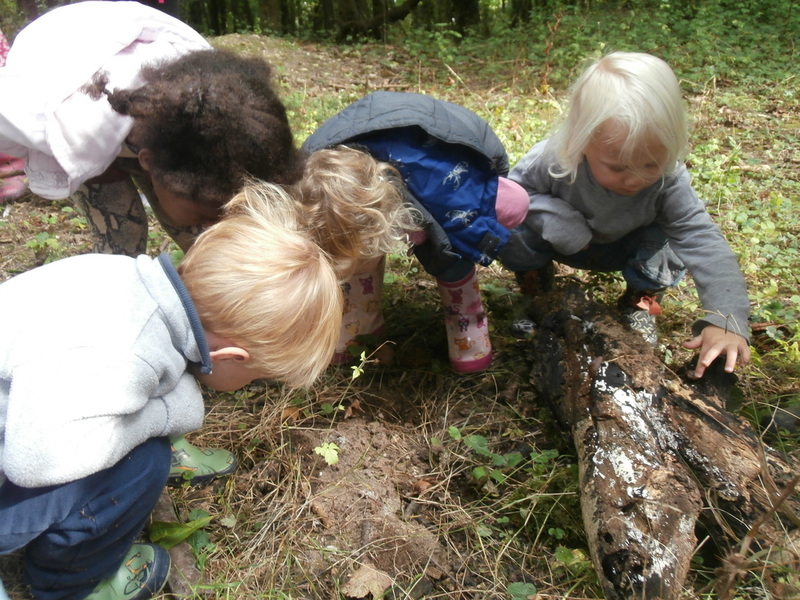 They fetched chalk and several became engaged in making marks on the logs to keep other people away from the building area because, “It might be dangerous”! 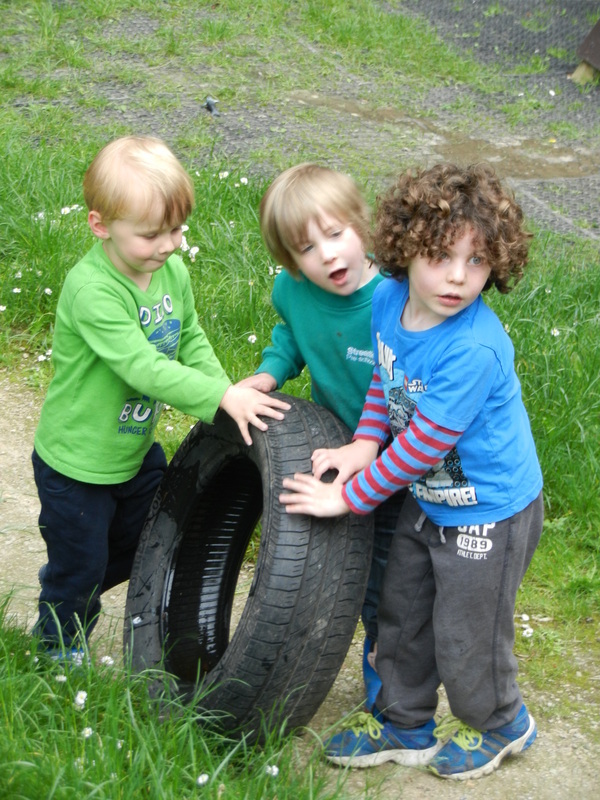 Some of the children were playing at camping and made a pretend campfire. They knew we needed sticks to burn so we went into the woods to collect some. 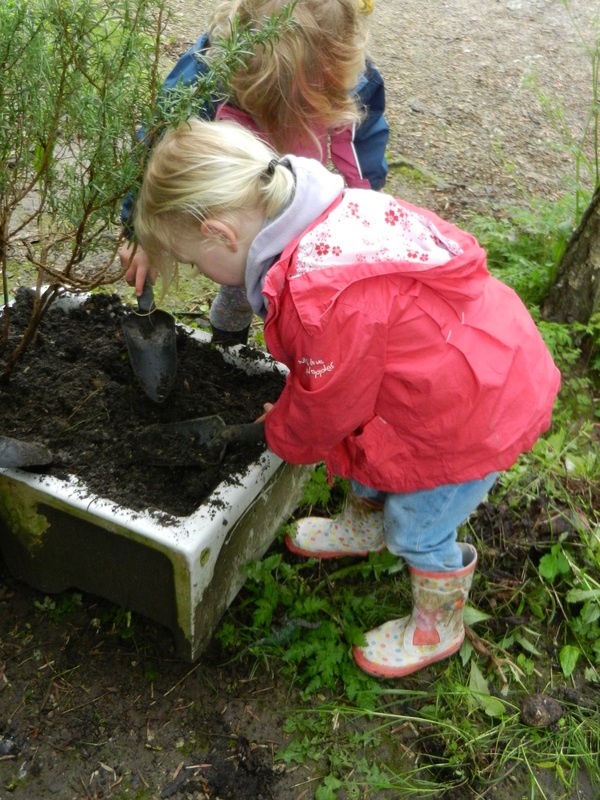 Then, on Wednesday (26th March), after a talk about keeping safe, we had a real bonfire in the Pre-School garden! 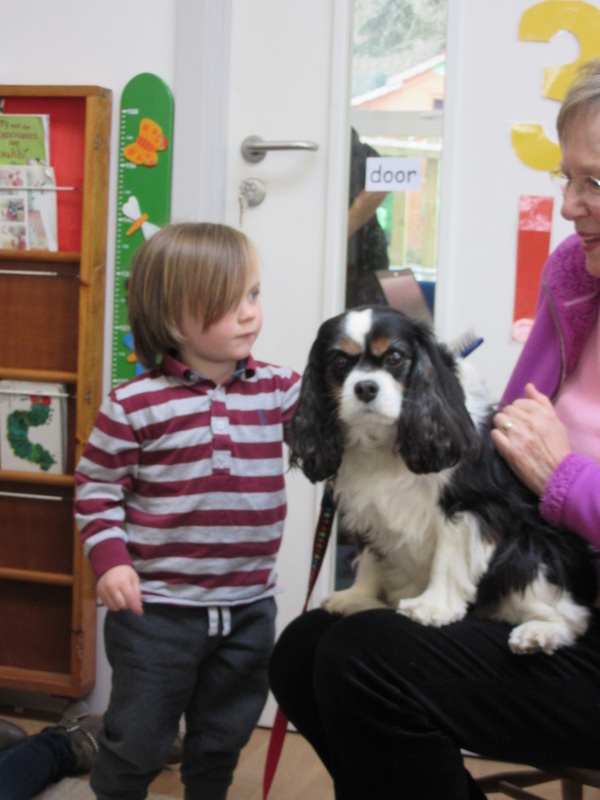 On 20th March Hetty, Albert’s Dog, came to visit Pre-School with Albert’s Daddy (Several children have been playing with the cuddly dogs and pretending to be dogs). The children got a chance to stroke her two at a time – she felt soft and warm. We watched Hetty eat her biscuits and obey commands such as “Stay” and “Sit”and there was a chance to ask questions like “What does Hetty have to eat? and “Does she eat bones”. It’s Spring! First we had crocuses and now the daffodils we planted in the Autumn are growing. We have been measuring them with rulers and ribbons and watering them. 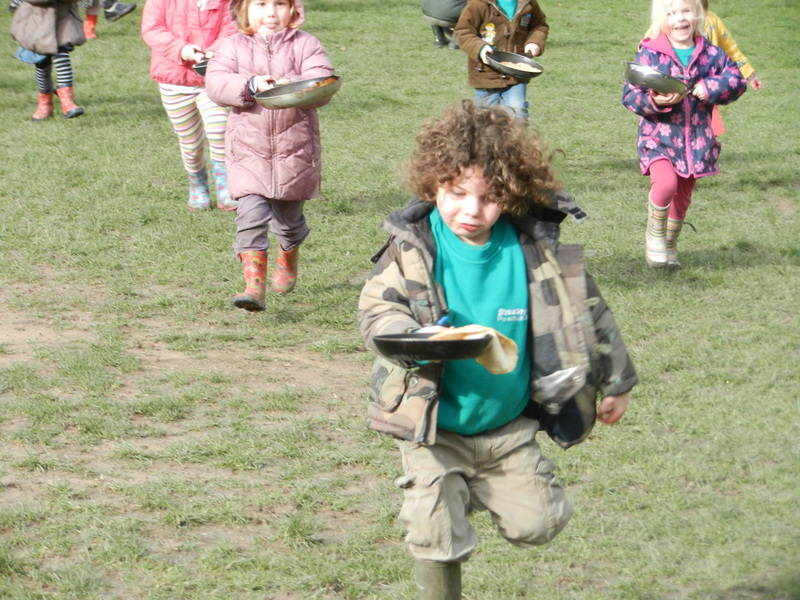 On Shrove Tuesday (4th March) we were invited by the “Big School” to join their Pancake races on the School field. 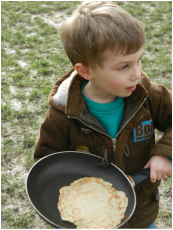 We each had a pancake in a frying pan and ran with it as fast as we could! 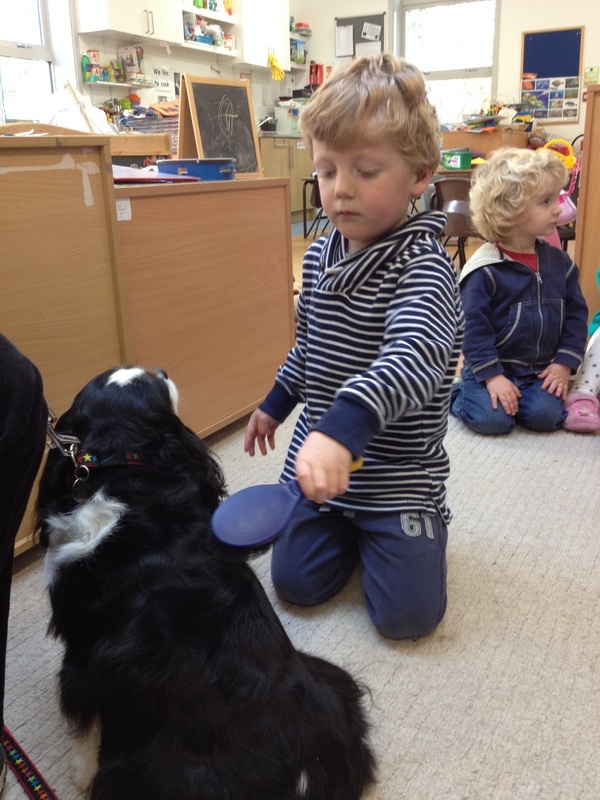 Pets - Some of the children have been role playing at being pets and one group of boys have been pretending the cuddly toy dogs are real! 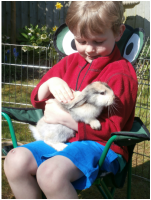 One little girl said she liked rabbits too – so we started a pet theme. This week “Rabbity” the rabbit has been to visit on 3 days. 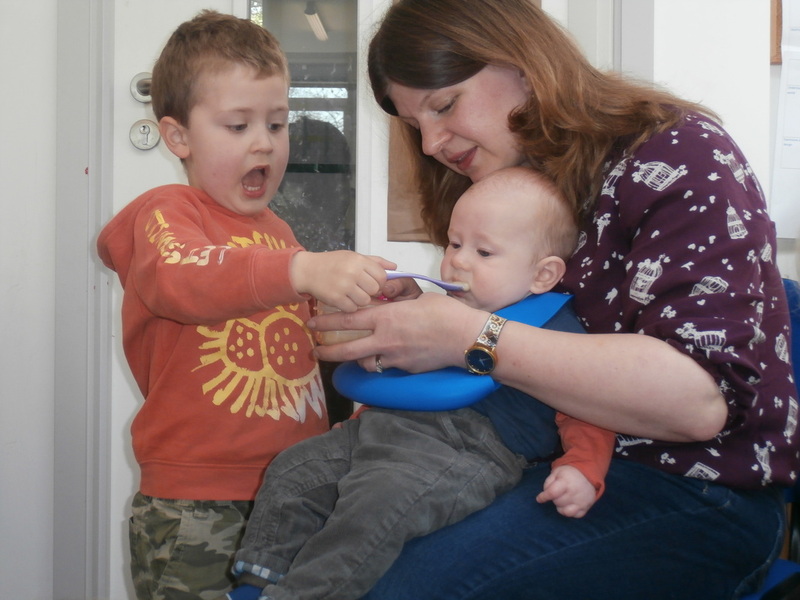 The children have all had a chance to hold him and stroke him – we talked about how soft and warm he felt. 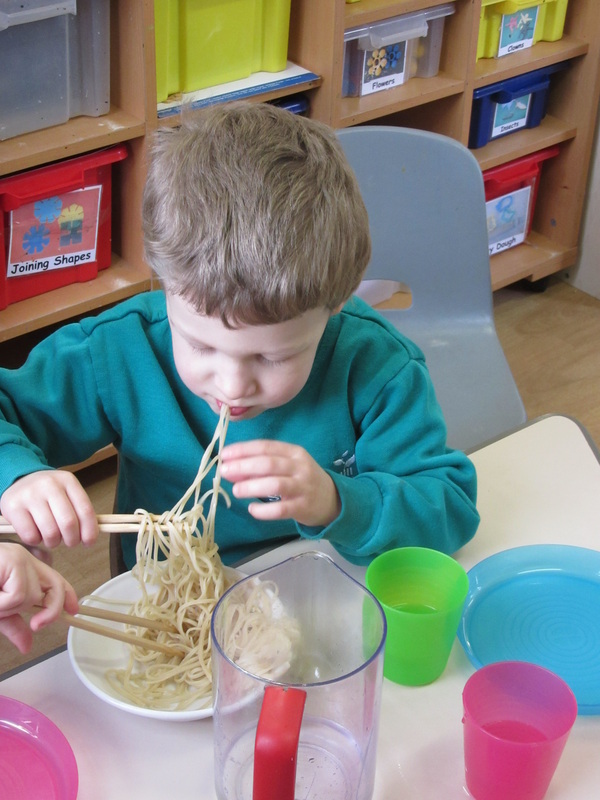 They have looked at the things he likes to eat and the way he hops about and wiggles his nose! And this week the rain finally stopped for a while and we were able to go in the woods again! 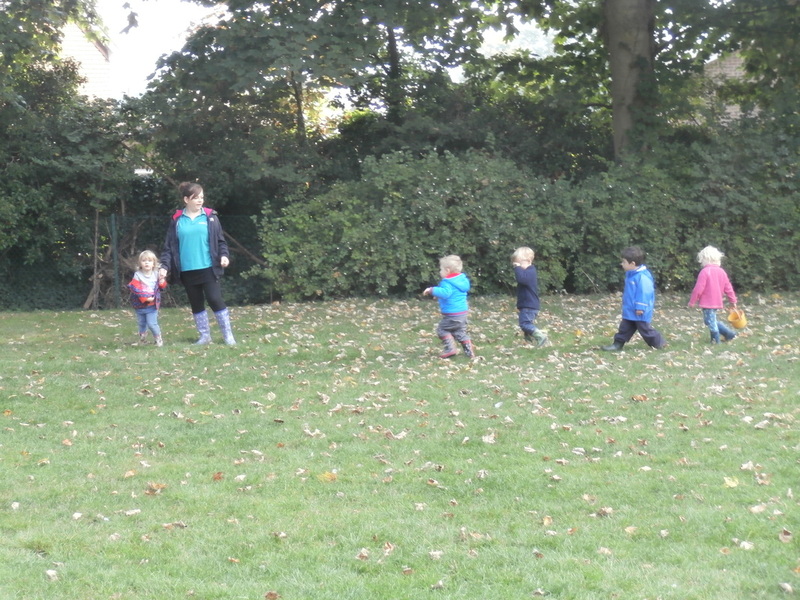 We climbed and balanced, scrambled, slithered and ran fast; we also played hide and seek! 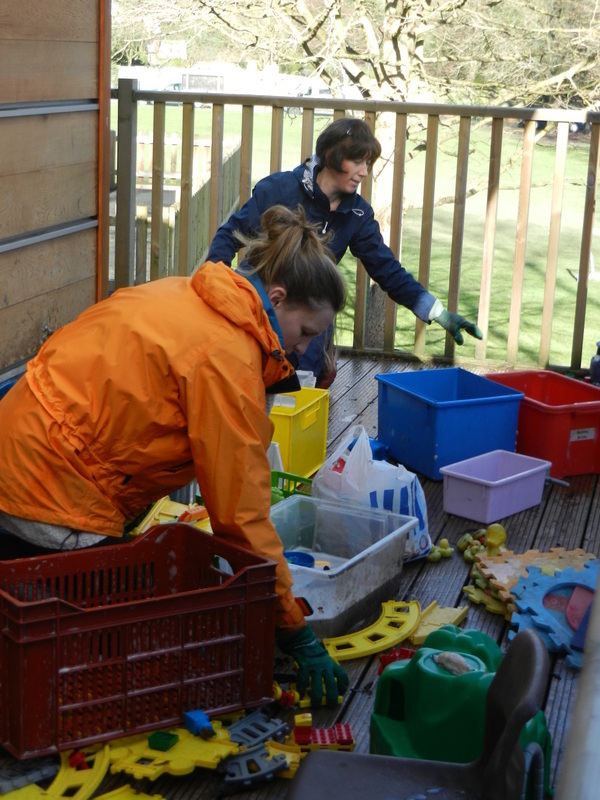 Garden Party - A big “Thank you” to all the parents who on 16th February, gave up 2 hours to help with the big garden clear up on a Sunday morning! Our PSCO is called Sue Nix. She spent much of the morning with us on Thursday 6th February. 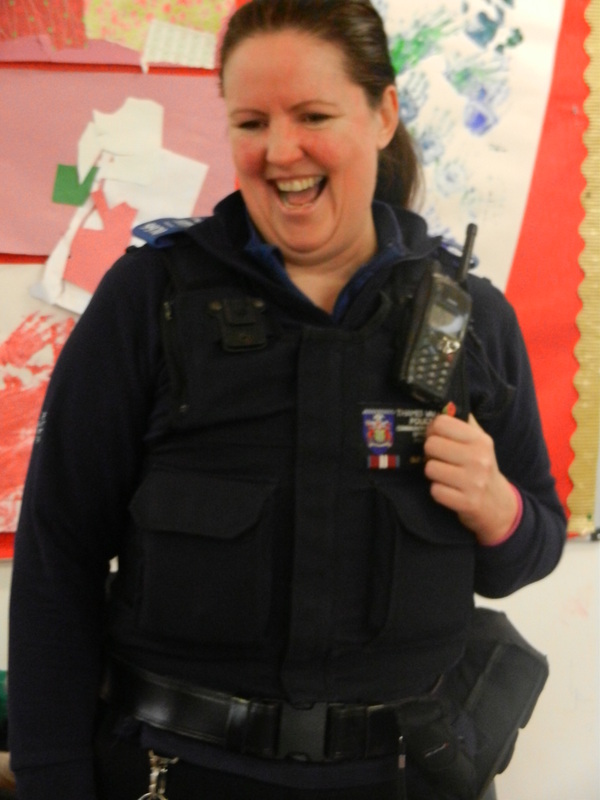 She showed the children her uniform, radio, badge, note book etc. She joined in and played with them answering their questions as they arose. 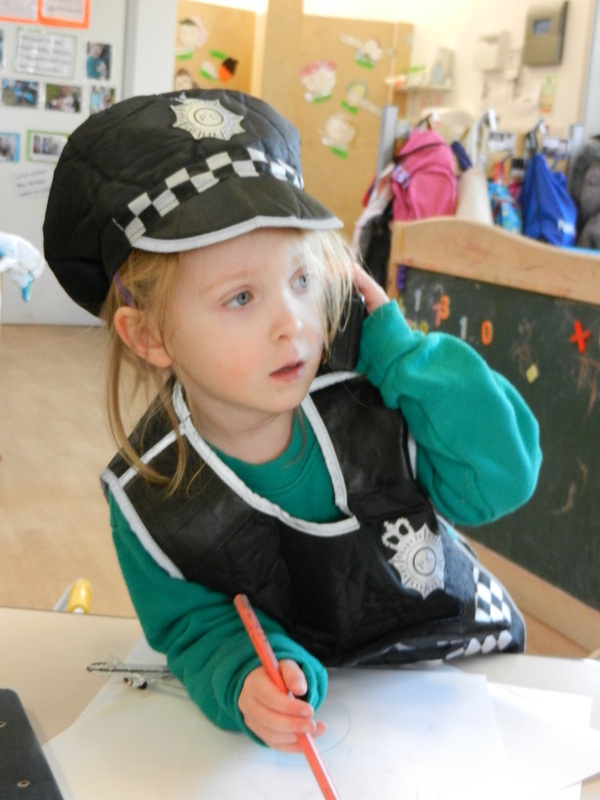 She took a small group at a time to see her police van and its contents and they all got to see the flashing lights and hear the siren! The reason she was invited to visit was because the children began playing police games. 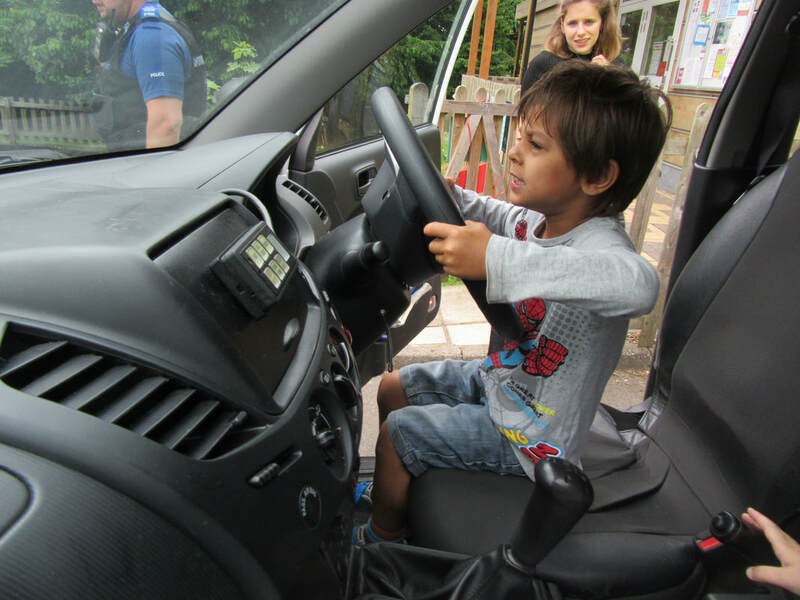 We asked them if they would like to meet a real police person? –and they said yes! 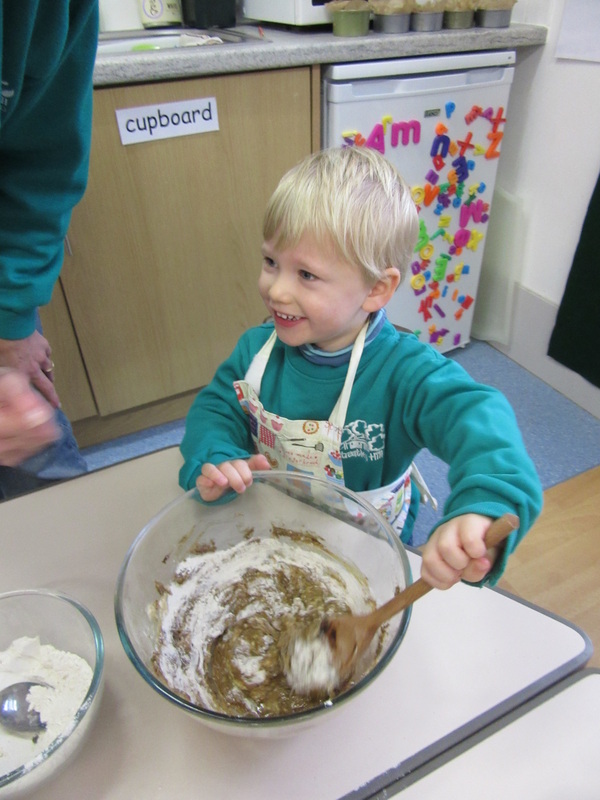 End of term activities included posting Christmas cards and making Christmas cakes. The Streatley Hill Pre-school Christmas shopping evening held at The Swan at Streatley was another great success. 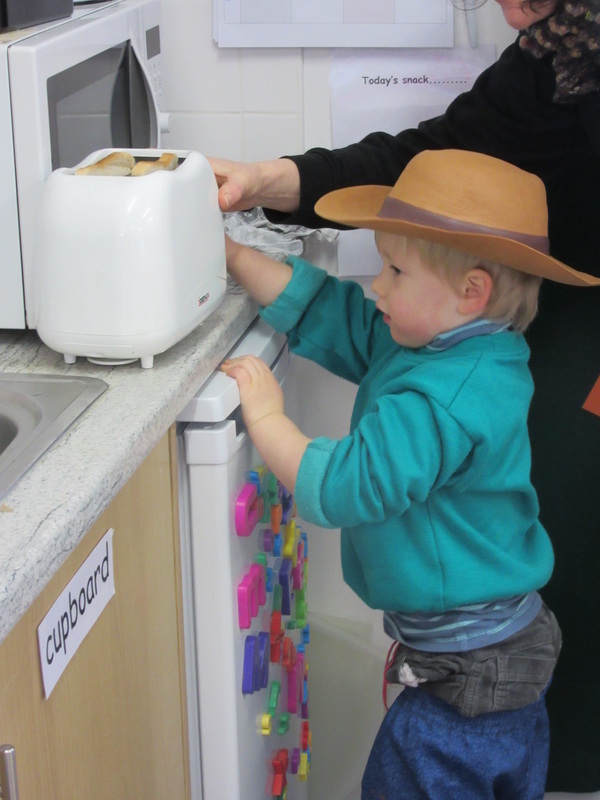 A fun evening was had by many, both those from the preschool (parents and staff) and by the public who came along. It was a busy evening with 27 stallholders and a fantastic raffle - many local businesses donated a range of great prizes; from hospitality tickets to see football and rugby; to pampering treats and other goodies! 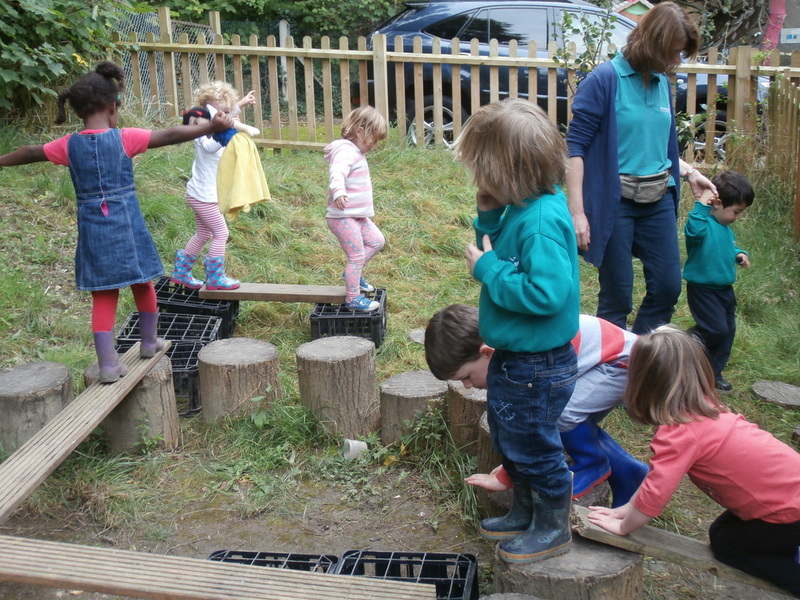 The event raised approximately £1450, which we will use to further improve the garden and outdoor area, making it a fantastic environment to foster learning and physical development. 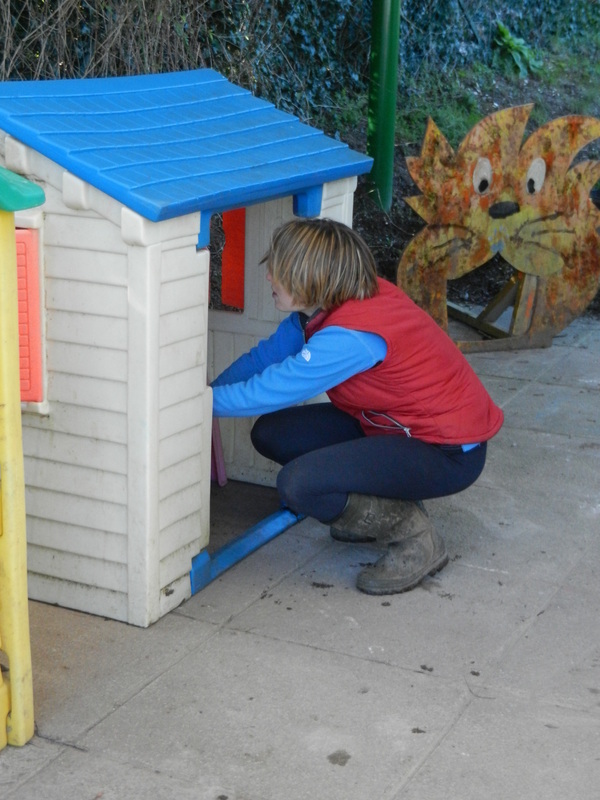 We have some great ideas for improving the outdoor facilities now the canopy is nearing completion, starting with the erection of a new play fort early in the New Year! The annual pre-school Halloween Disco was a great success! 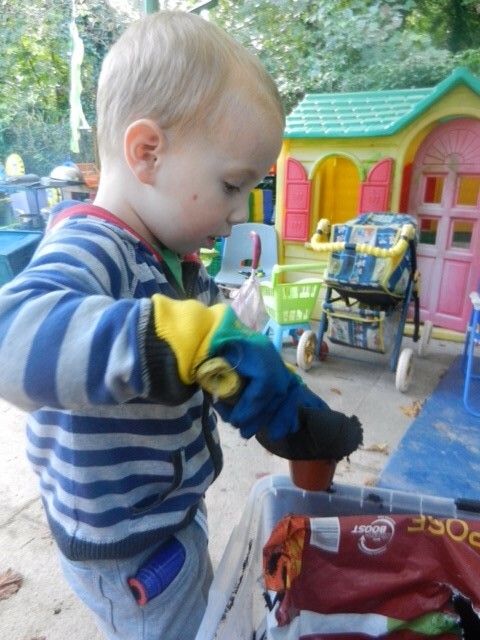 We have been enjoying the good weather this Autumn spending much time in the garden. 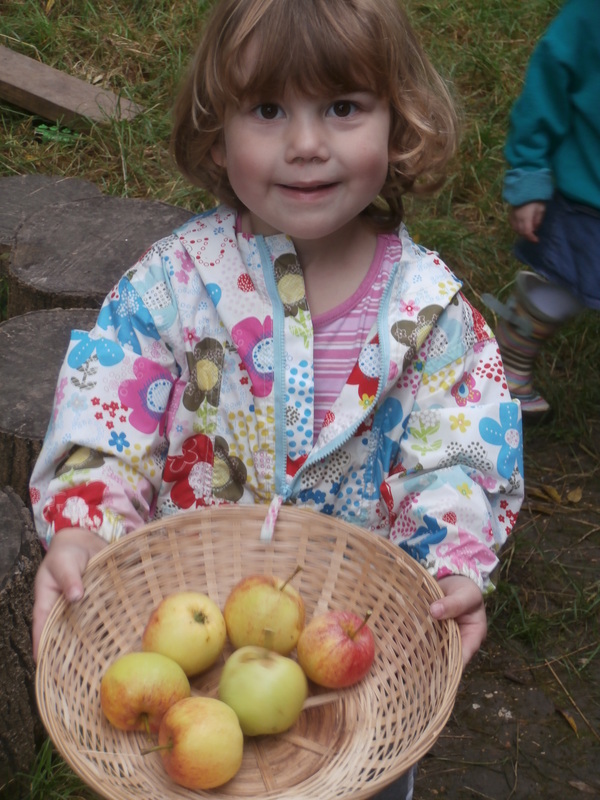 The children gathered windfalls from our apple tree and collected conkers. 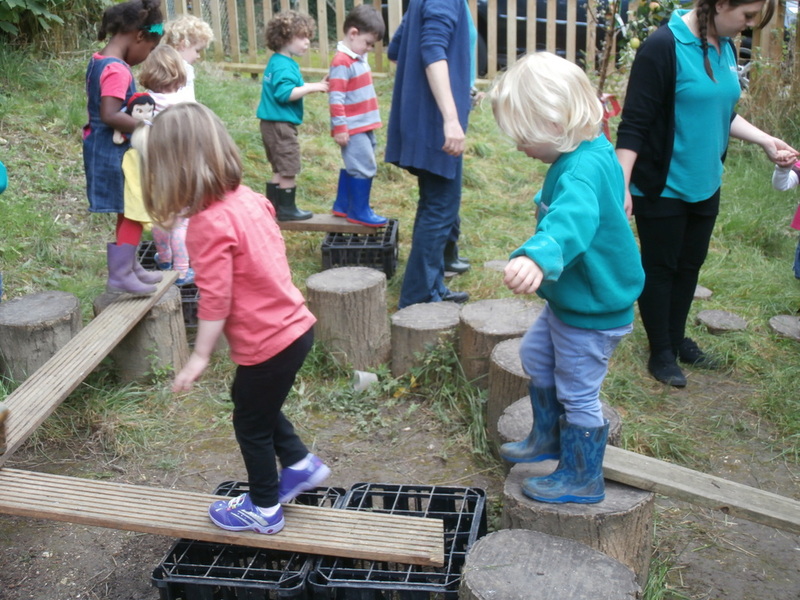 Building obstacle courses in the garden. 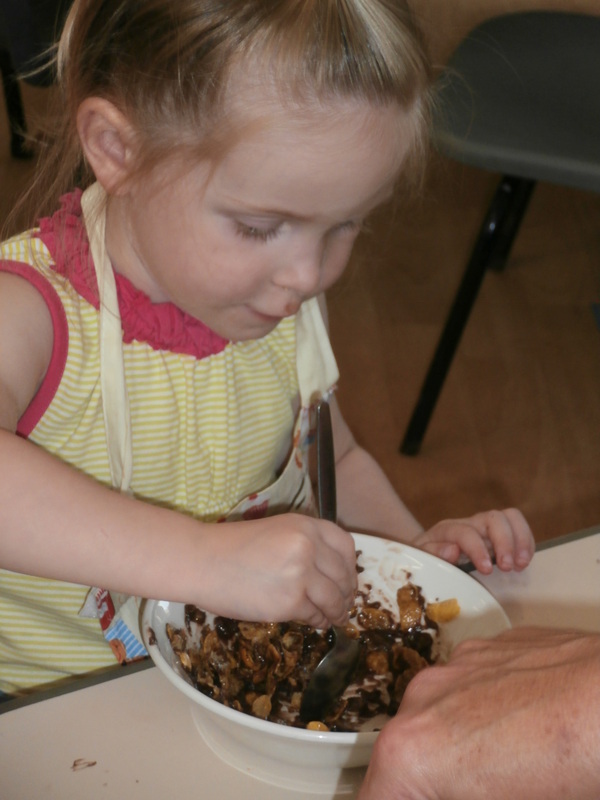 And lots of fun activities indoors too! Story time! 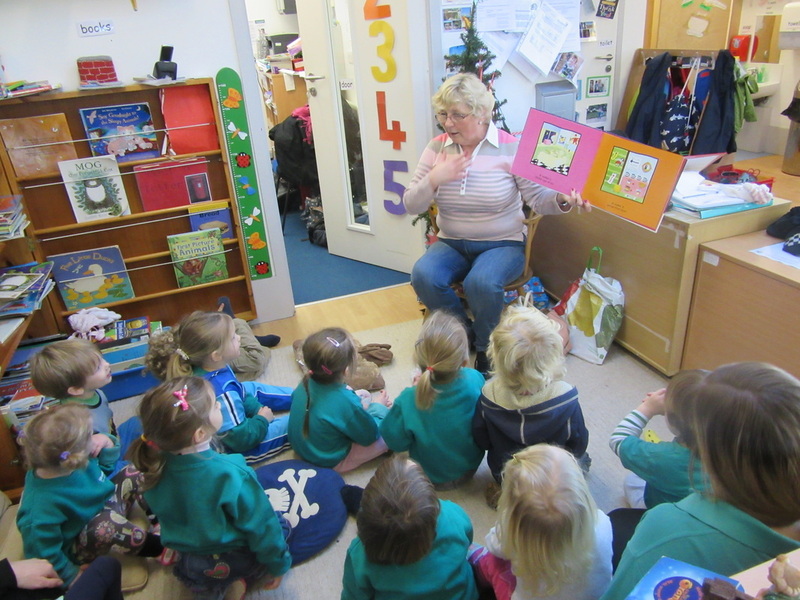 We love to have our parents and carers involved in pre-school activities including reading the children a story. 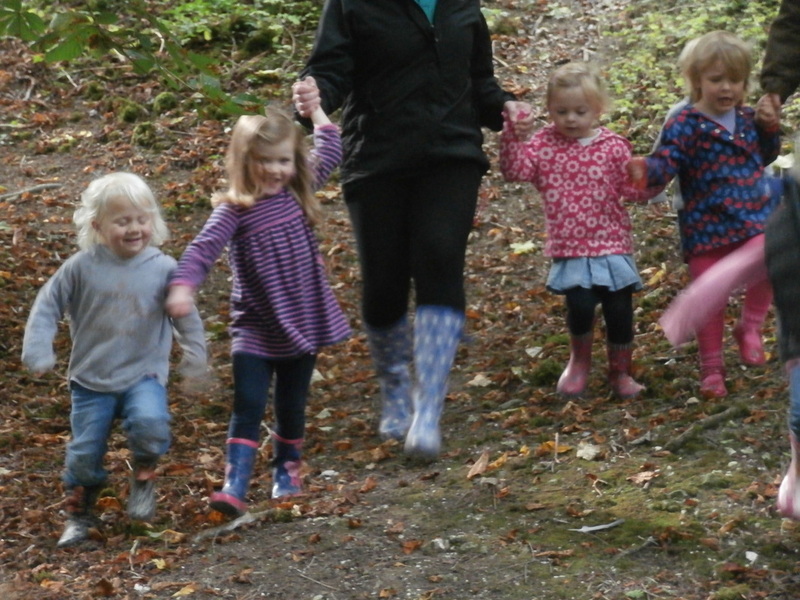 The children enjoyed a lovely early Autumn walk in the woods near pre-school. 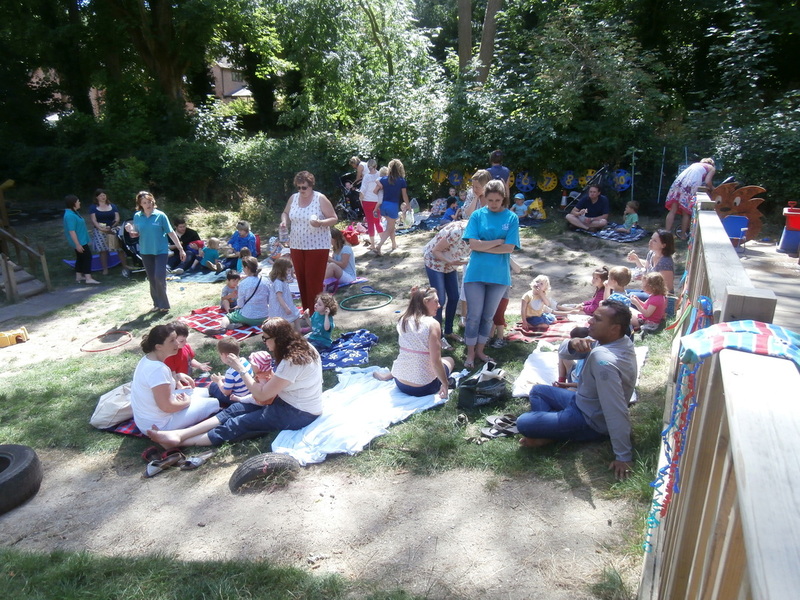 We had a lovely picnic to celebrate the end of term, and the children who were leaving for school were each presented with a book called Starting School. 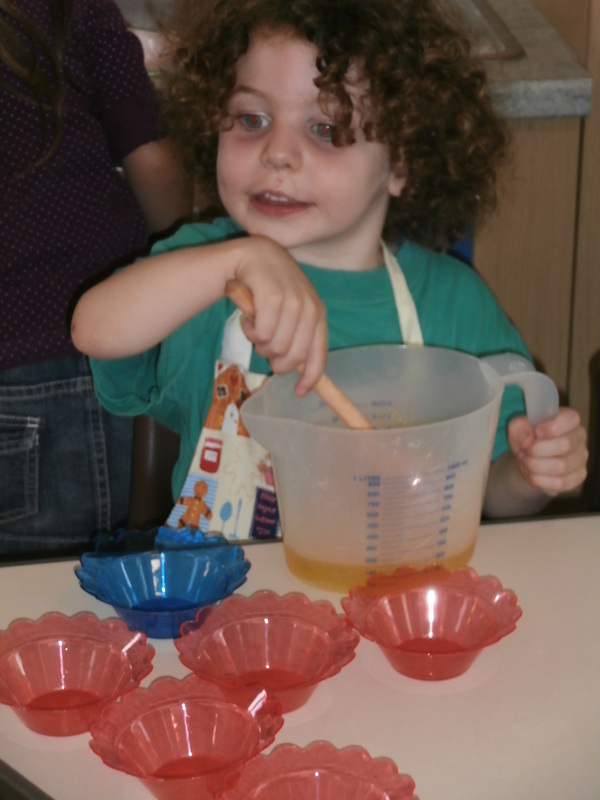 The children made their own sandwiches, jellies and Krispie cakes. Several parents made cakes to share - this one expressed an opinion! 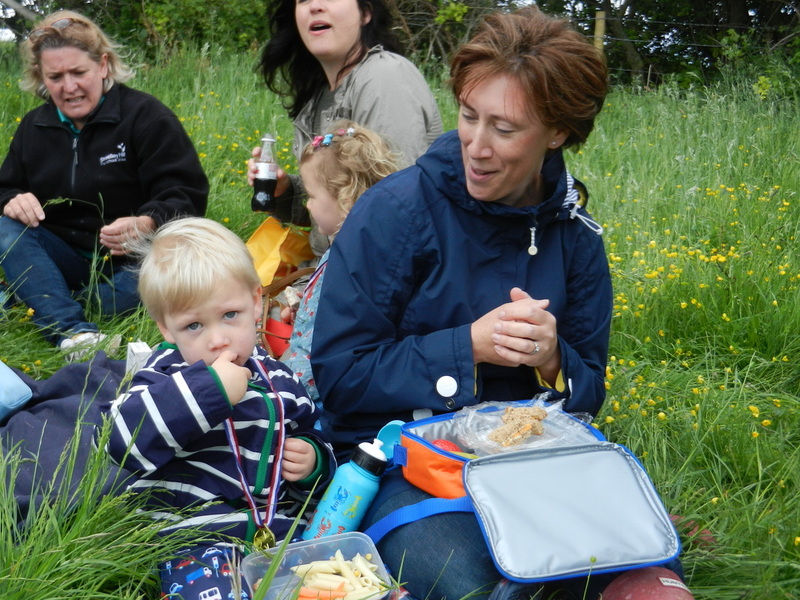 The children, parents, siblings, grandparents and childminders all joined in the picnic! Our Community Nurse, Lauren, came to visit. 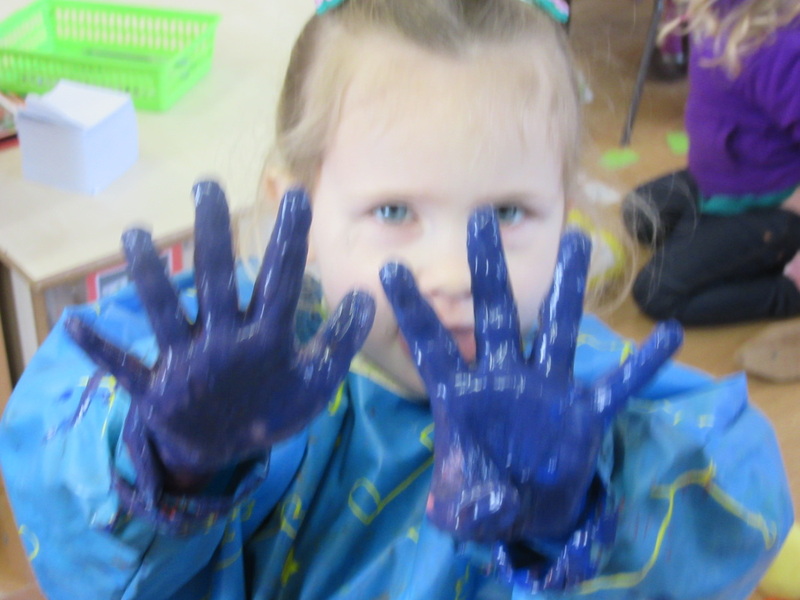 She told the children all about when they should wash their hands and the importance of doing it properly. She showed them how to do this using her bag of magic germ dust, which showed up under the ultraviolet light. 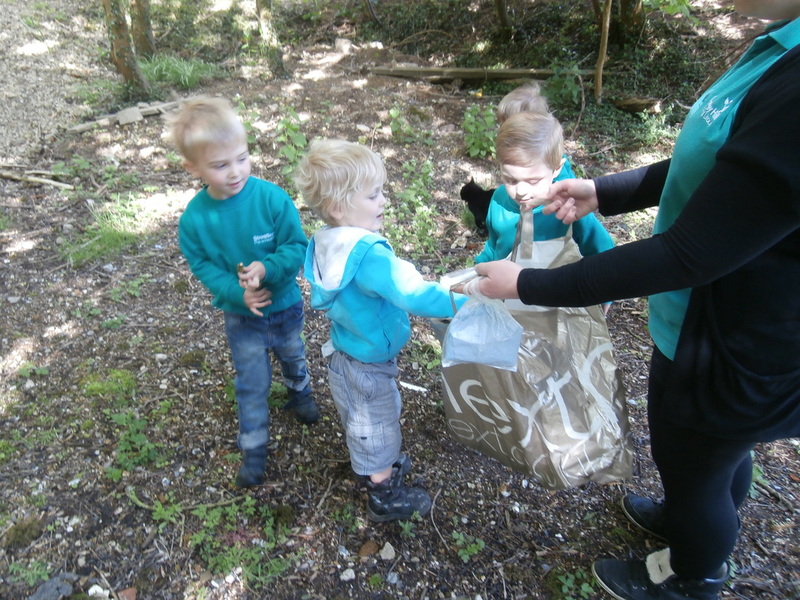 The pre-school children have welcomed two new fish! 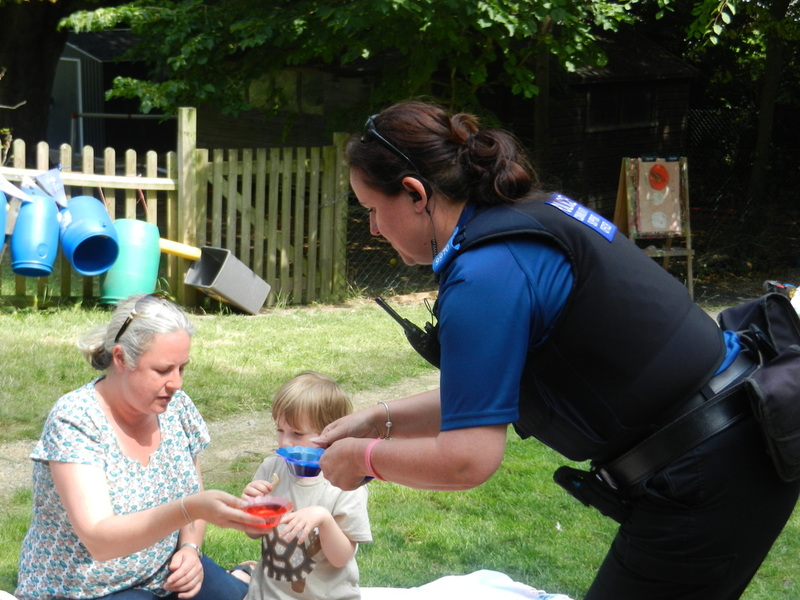 The pre-school held a successful "salon" stall at the primary school summer fete. 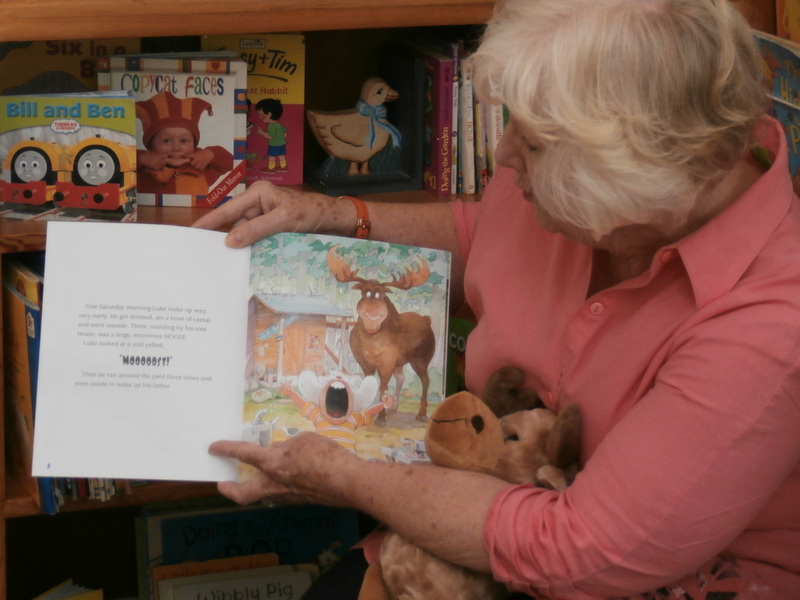 Jay’s Grandma came over from Canada and read us a story about a moose. 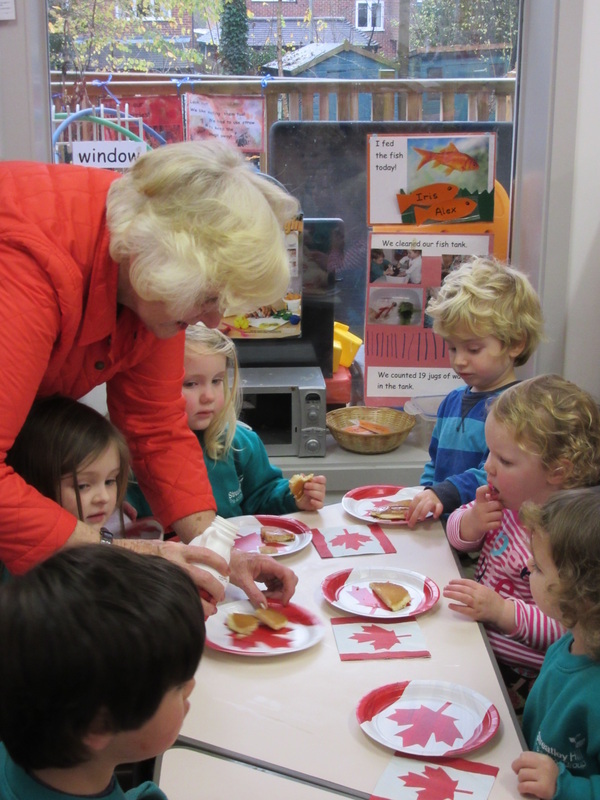 She told us lots of things about Canada and brought pancakes with maple syrup and Canadian maple syrup candy for us to try on maple leaf plates! 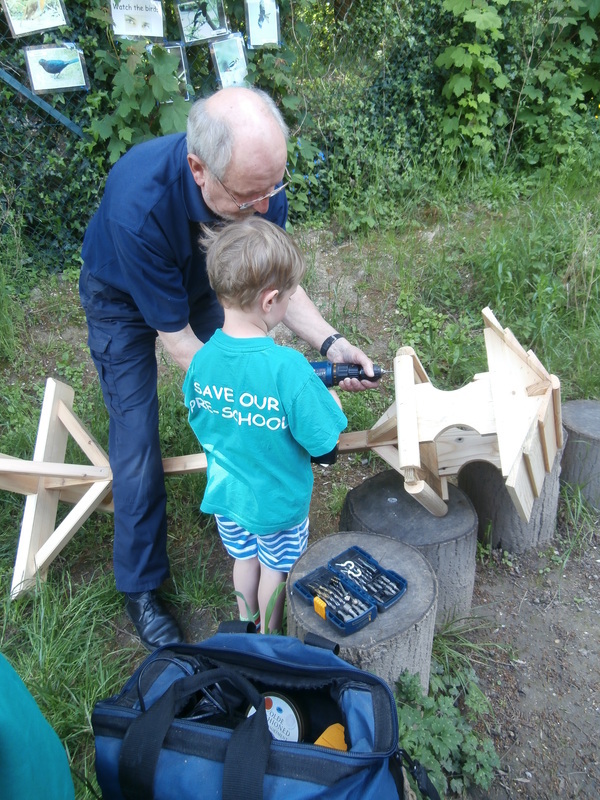 George from the RSPB came to deliver our new bird table. 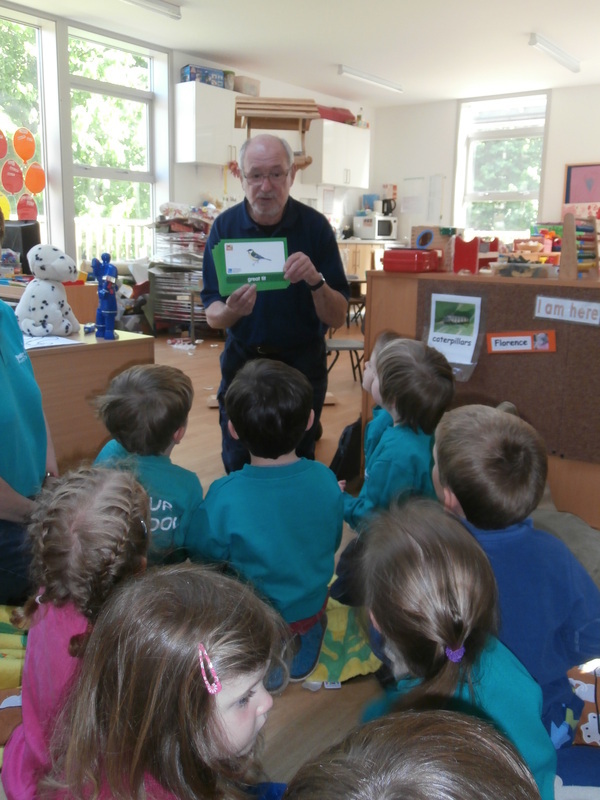 He told us all about birds we might see in our Pre-school garden. 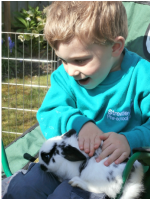 The pre-school children enjoyed visiting baby rabbits at the nearby home of one of their teachers. Some children cut up paper to make a bonfire! We took them in the woods to collect some sticks. We built a real bonfire! We talked about fire safety and learned how to call the Fire Brigade! Since several of our children were very involved in playing with and bathing baby dolls, we invited four babies to visit on four different days! 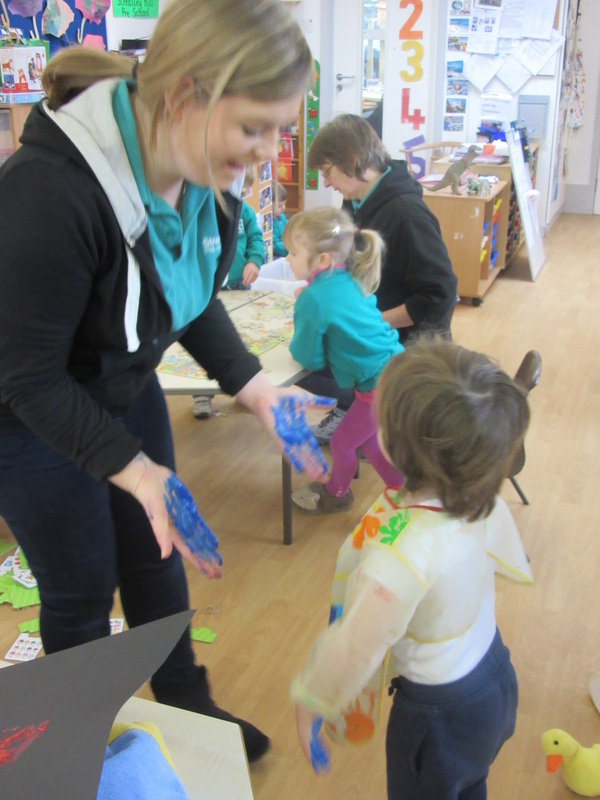 The pre-school children were very excited to join in and help care for the babies. 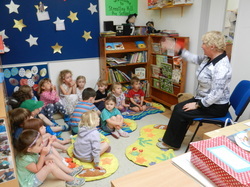 Local author Bev Wilden read us her book about monsters and another story, taught us some new rhymes and organised some craft activities. 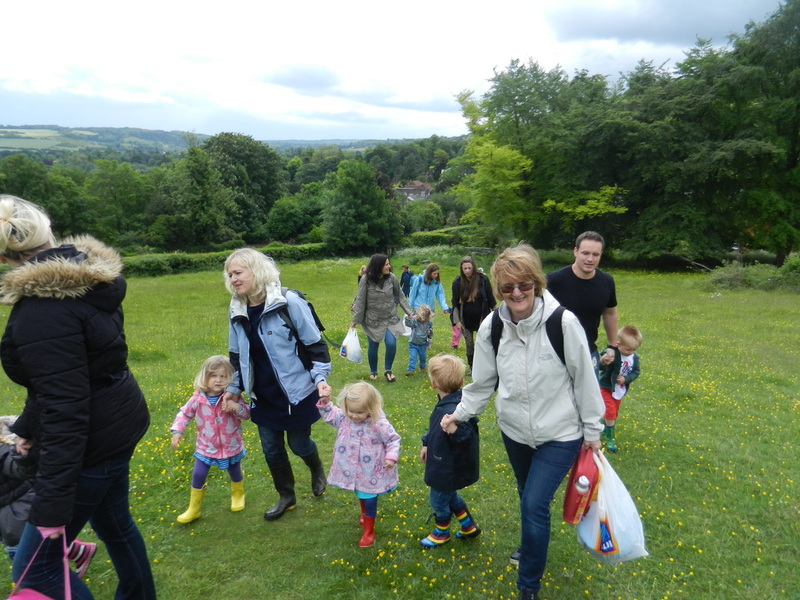 The annual Easter Egg Hunt took place on the grounds of Gatehampton Manor in Goring, thanks to our generous hosts, the Farrs. 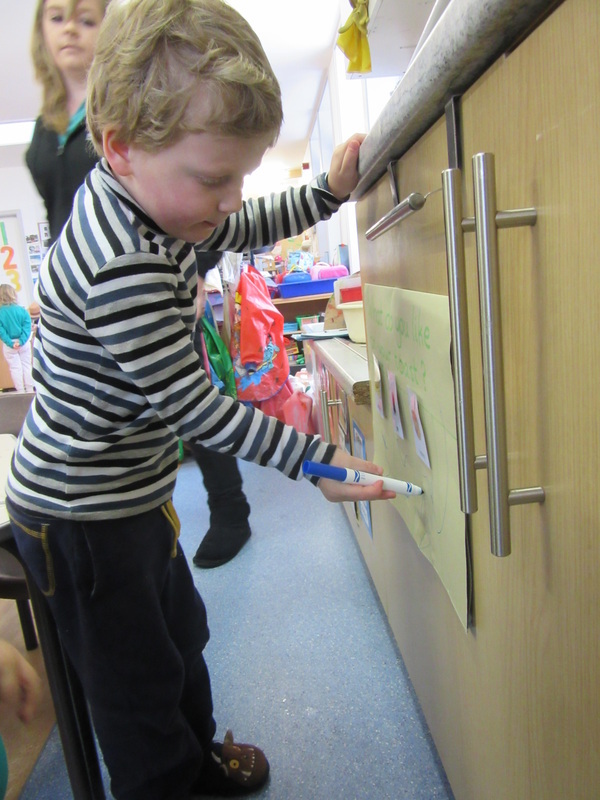 The pre-school children enjoyed matching the Easter-themed pictures in the scavenger hunt to earn their chocolate eggs. 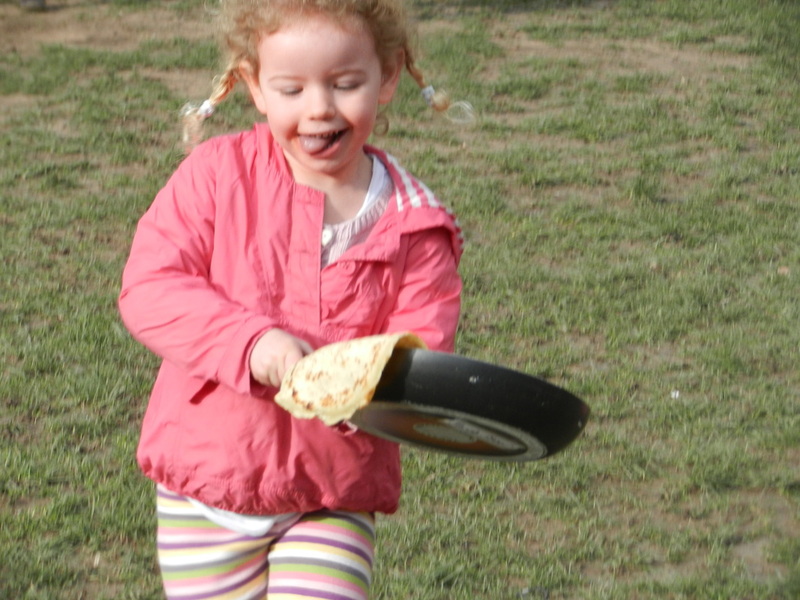 The pre-school children were invited to cheer on the primary school children at the recent Pancake Race. 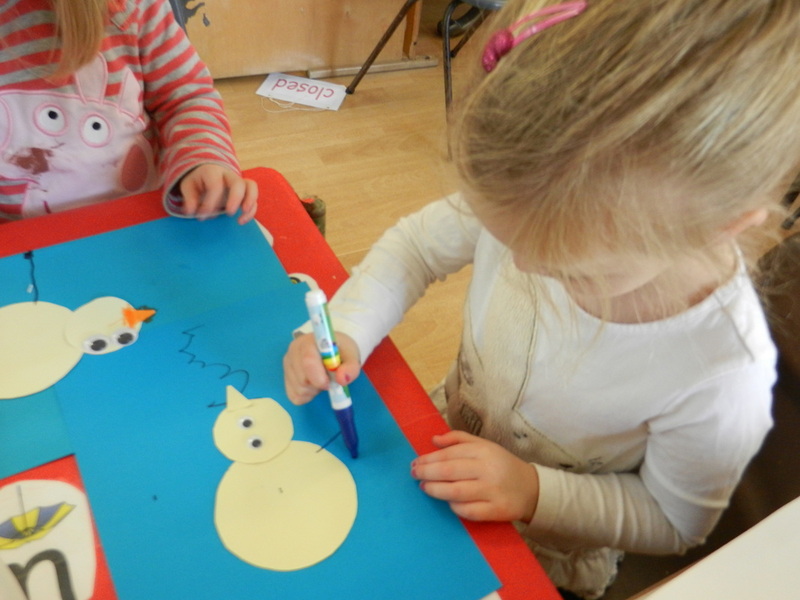 The annual preschool Christmas party took place on Friday 14th December 2012, 12-1.30pm at The Morrell Rooms, Streatley, with a very special guest appearance from Father Christmas. 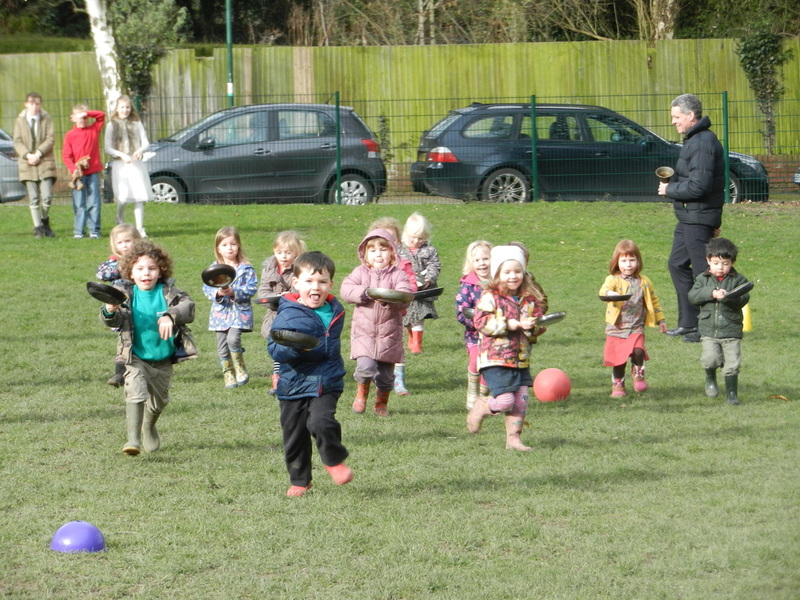 It was a fabulous end of term for all our little boys and girls. The annual Christmas shopping night took place on Thursday 29th November 2012. 7.30pm at The Swan & Streatley Hotel - purses were dusted off and supporters started their Christmas shopping early to avoid the December rush! A massive thank you to all who helped out at the shopping night - we raised a whopping £1380 which was a record! 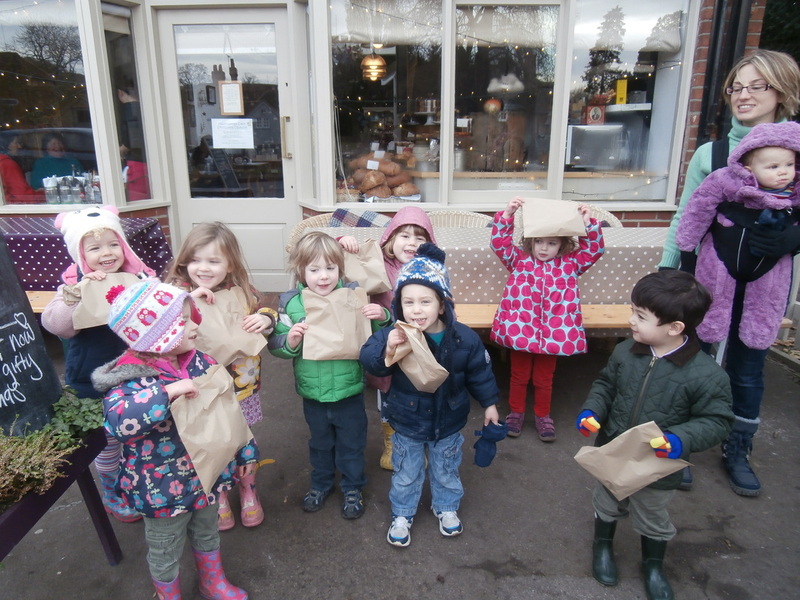 The annual preschool theatre trip took place at Norden Farm in Maidenhead. 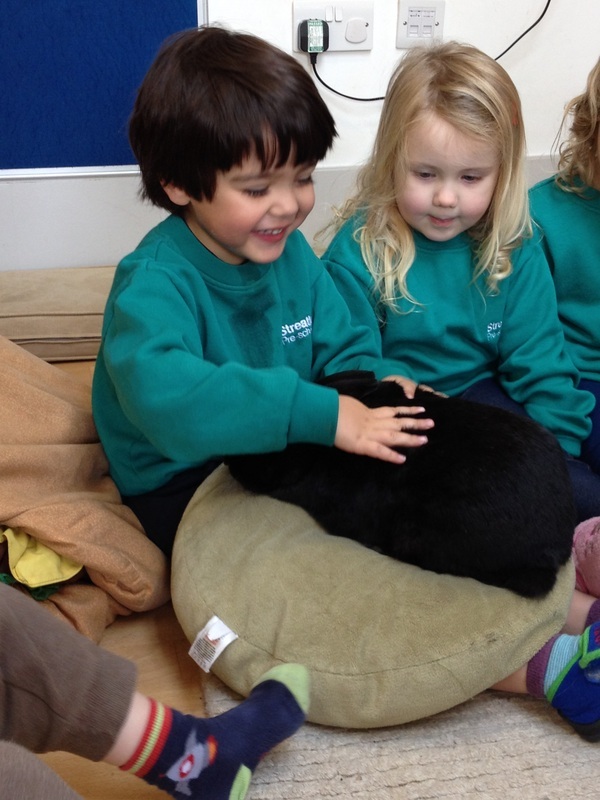 Rabbity the bunny and Freddie the kitten visited the preschool and enjoyed all the attention! The annual preschool Halloween disco took place on Friday 26th October 2012 at 4.00pm at Goring Village Hall, for all our little vampires, ghosts and witches! 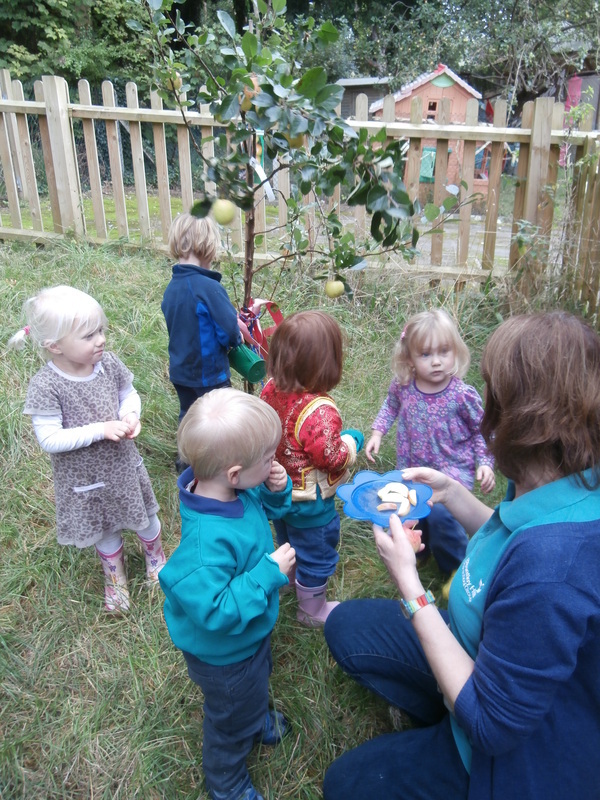 The Foundation Stage children from the primary school joined the preschool children in the garden for a bonfire and a sing-along. 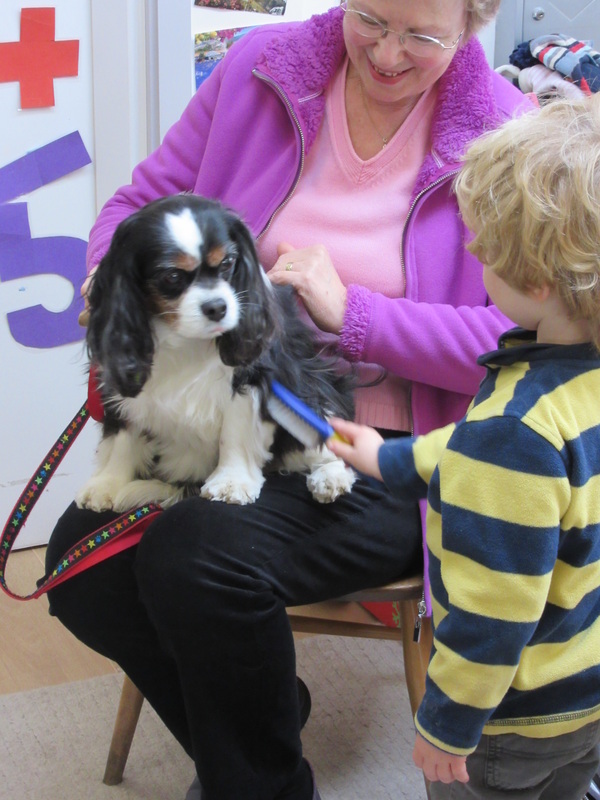 The children enjoyed a visit from Hetty the dog and learned about Autumn leaves! 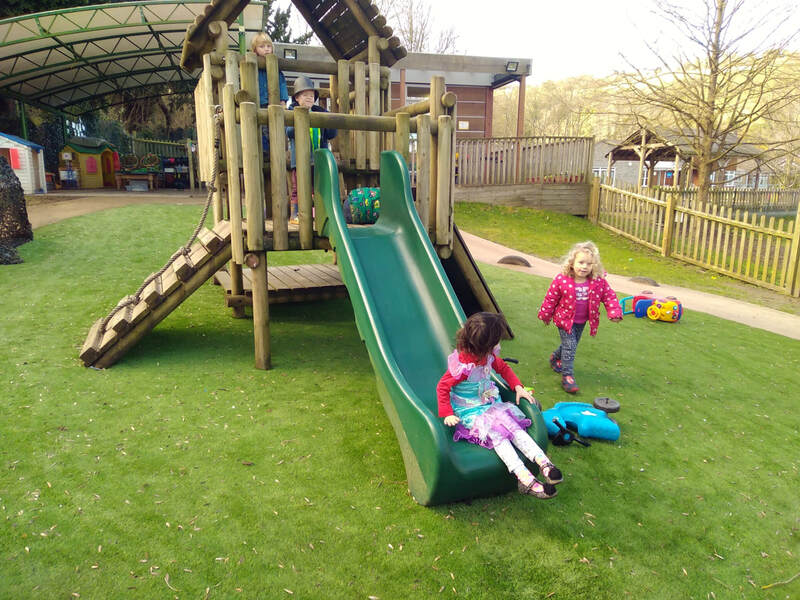 To celebrate nearing the end of term, a number of Streatley Hill Pre-schoolers descended on Legoland, Windsor on Friday 29th June for an action packed day. The children had a fabulous time and our thanks goes to the parents who organised the trip on our behalf. 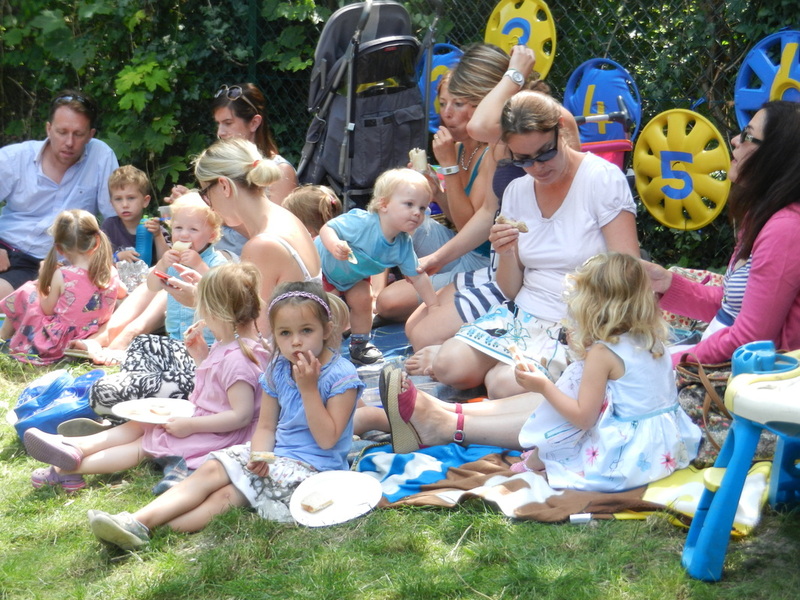 On Friday 1st June 2012, the sun shone and the Streatley Preschoolers joined Streatley Primary School for a joint "Street Party" in the grounds of Streatley Primary School. 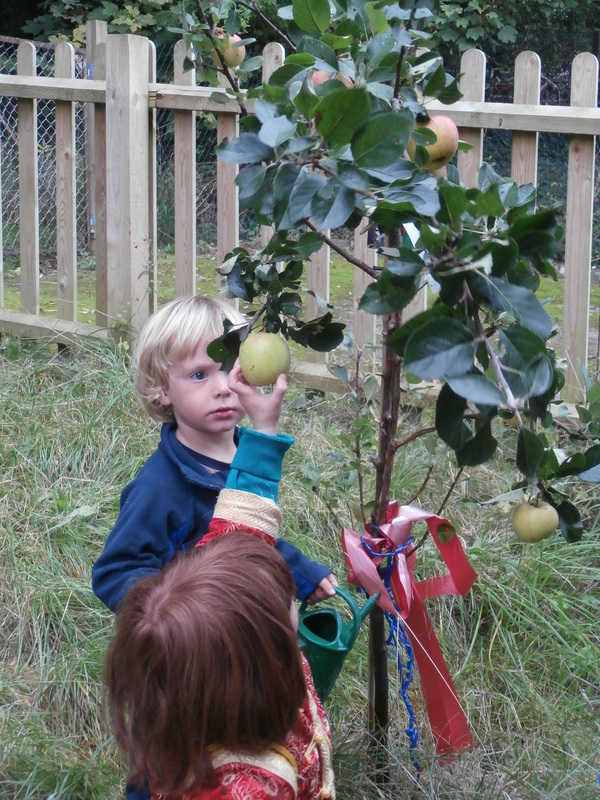 The children were actively involved in their Jubilee preparations, and even planted a Jubilee tree in honour of this special occasion. A big thank you to all of the organisers who did a fabulous job and a great time was had by all! The Hairy Legs Challenge took place on Sunday 13th May 2012. 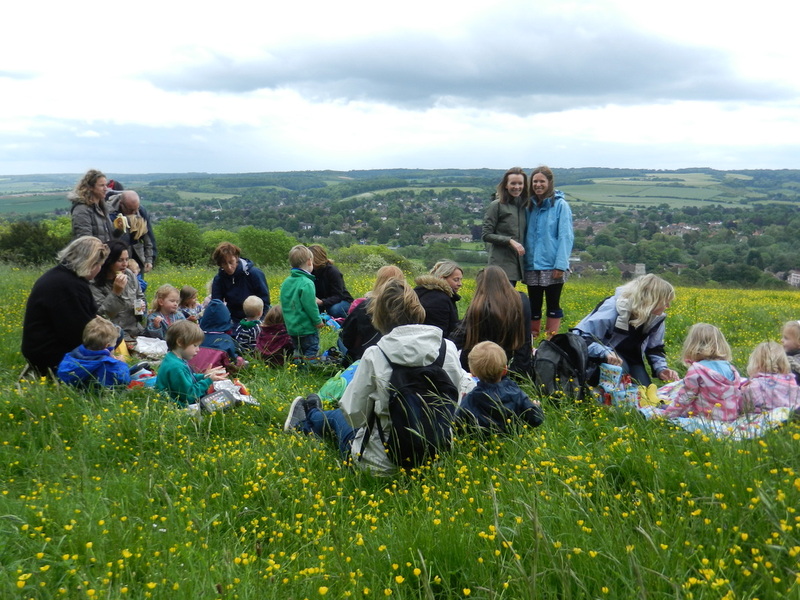 The annual Streatley Hill Easter Egg Hunt took place on Sunday 15th April 2012 in the grounds of Gatehampton Manor, Goring. Our thanks goes once again to the Farrs for hosting. The annual Streatley Hill Preschool Christmas Party took place on Friday 16th December 2011 in The Morrell Room, Streatley, with a very special guest appearance from Father Christmas for all our little boys and girls, who were so good throughout the year! 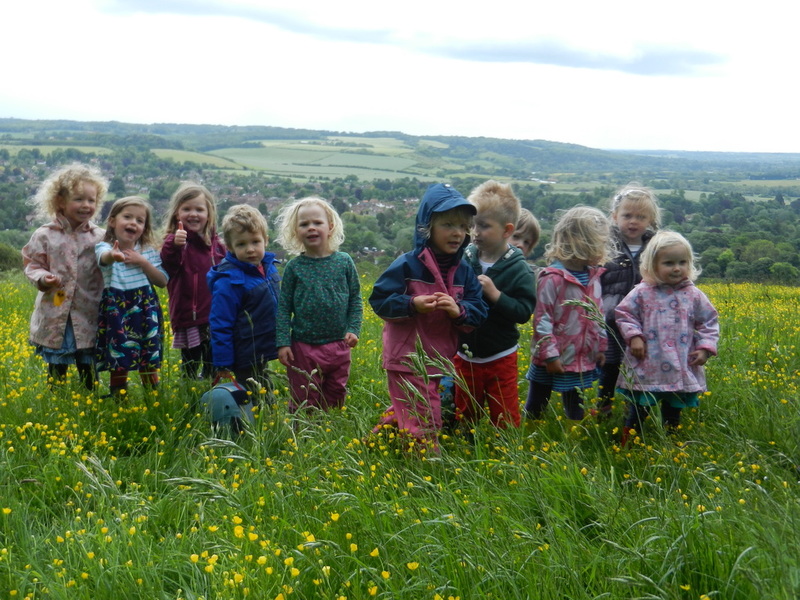 A group of very exuberant Streatley Hill Preschoolers descended on Norden Farm Centre for the Arts in Maidenhead to see "MIKI" by Stephen Mackey. 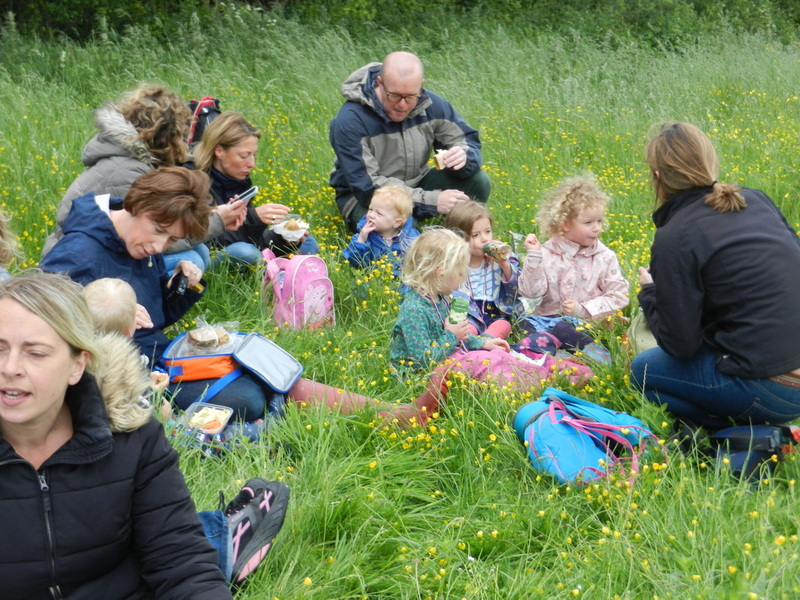 A great time was had by all, and our little boys and girls were extremely well behaved as always.